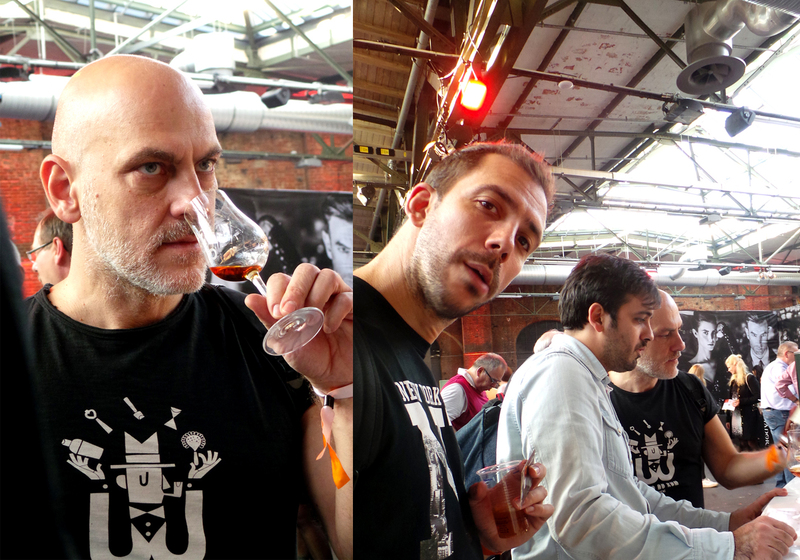 Europe is exploding with rum events in the fall and just a week after the rumfest in Athens, it was time for a few others, for example the ShowRUM in Rome, UK Rumfest in London and the German Rumfest in Berlin which is the one I headed to, but unfortunately this year, London and Berlin happened at the same time. 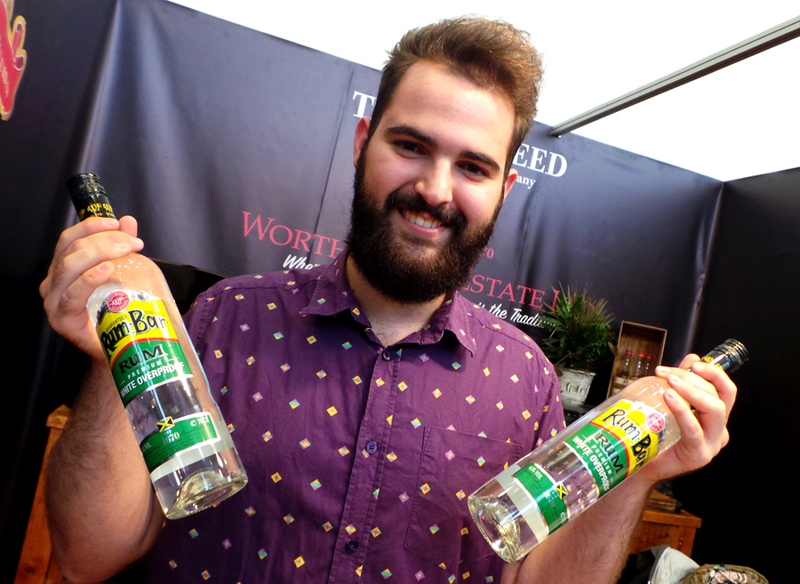 I have been to the UK Rumfest a couple times but never to Berlin so this was extra interesting, and it didn`t get worse by the fact that Baba au Rum had a pop up bar the whole week from the start of the BCB (Bar Convent Berlin) to the end of the Rumfest at the My June bar. They had even, with the help and organizing by Alexandra Barstalker brought the same wallpapers (which btw I learnt is made by a Swedish designer) that are on the walls in the Baba au Rum bar in Athens to My June Bar to make it even more like “at home in Baba”, well that my friends is looking into the details! 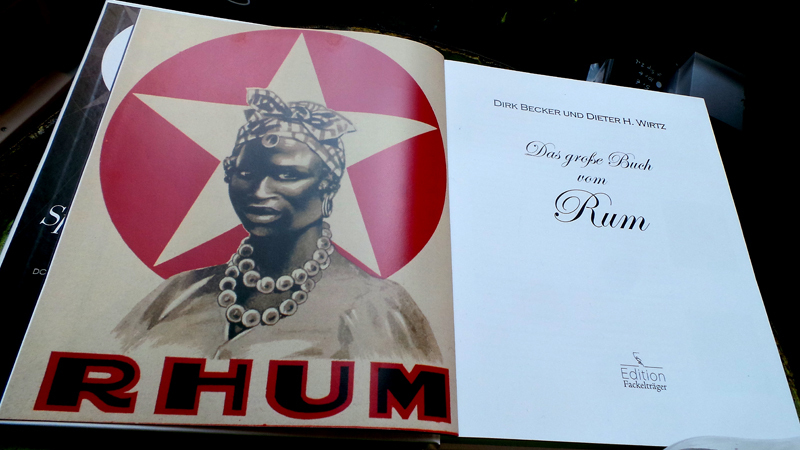 if you go to her website you can read about how the idea about “Baba au Rum goes Berlin” came to be. 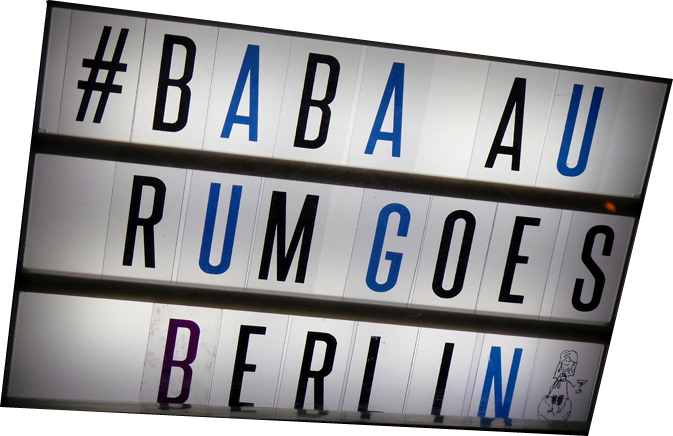 Berlin is a huge city but with a packed schedule on a few days I didn`t see that much of the city itself, except for going to some bars, restaurants and tastings, among them the “My June Bar” where Baba resided. 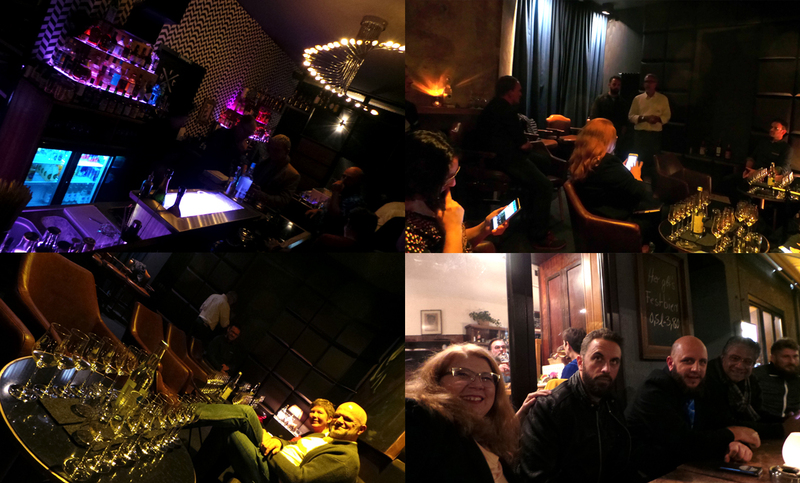 The first night was apparently THE night to be there because virtually everybody in the booze/rum industry was there and it was really a crazy kick-start of the rumfest weekend and at the same time the closing down party of the BCB. 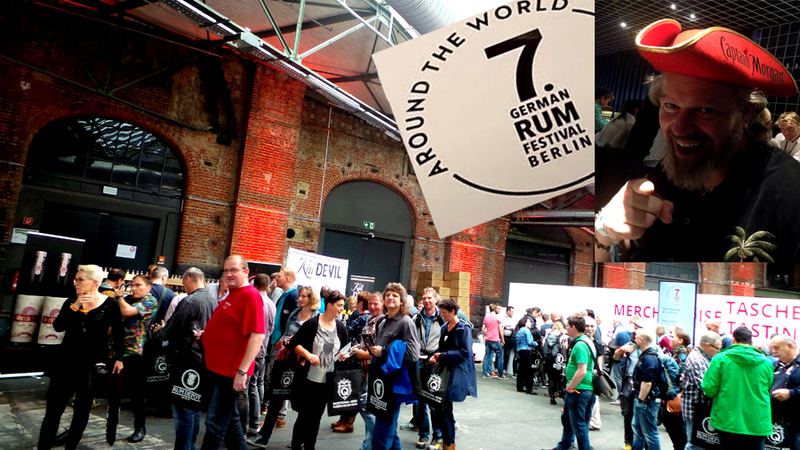 The German Rumfest is really huge and very well organized, and the rum selection was very good, I just missed the Velier rums there but they were in London at the UK Rumfest. Luckily the next year these two will not happen at the same time! 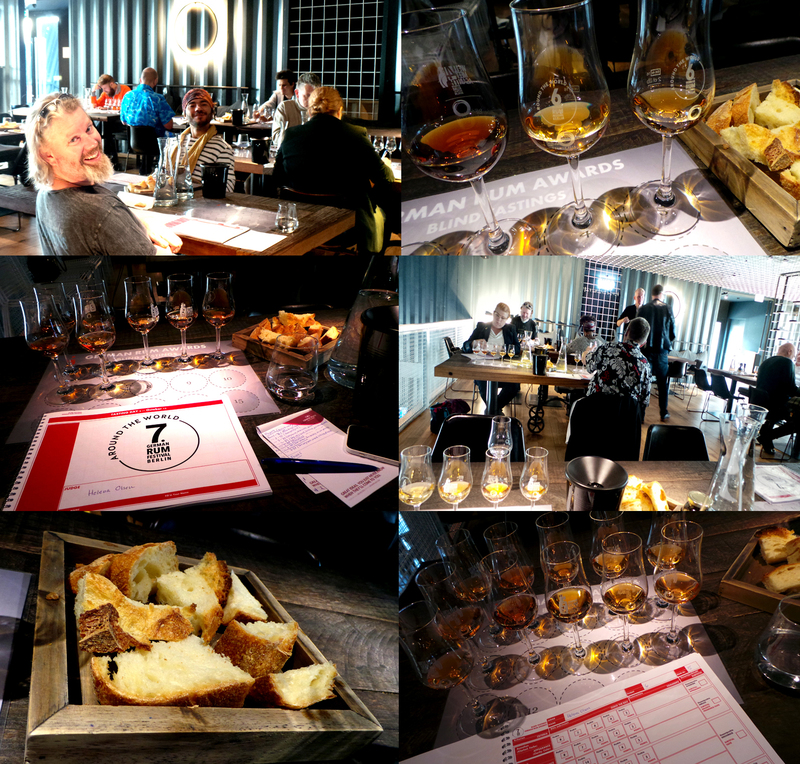 As a rum judge we had two days to do the rum tastings before the rumfest started and so that kept me busy and in very good company! 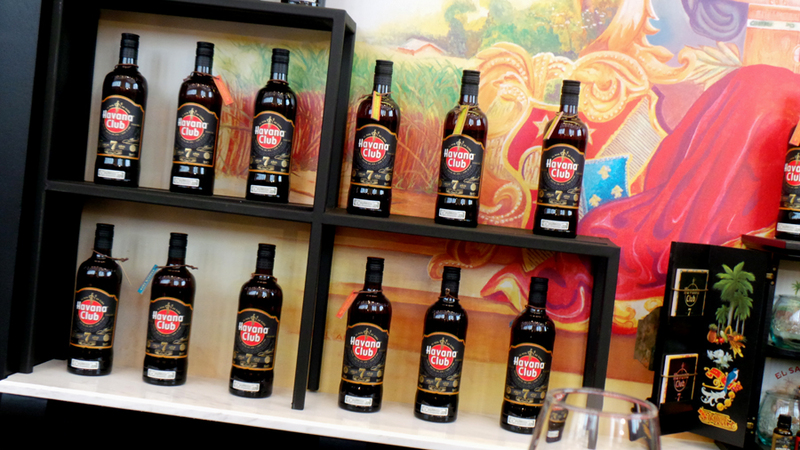 always so nice to see friends from the “rum family” at various rum-filled events. 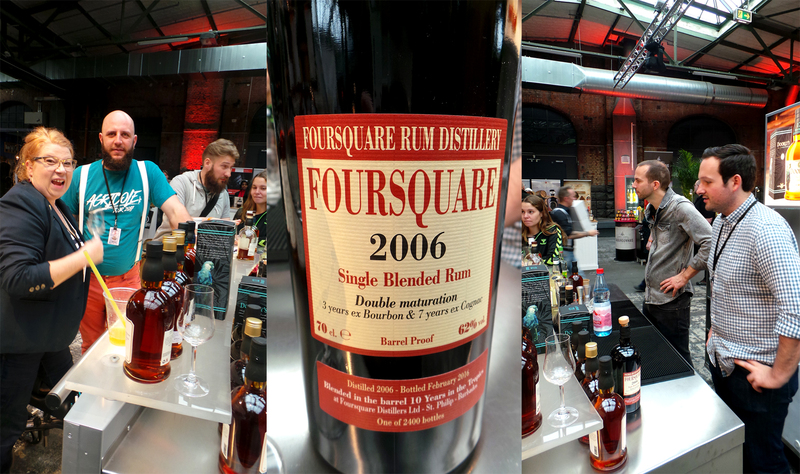 Interesting to me was the contrasts between attending first a small and intimate rumfest (Athens) and then a really huge one. And both has their own charms. 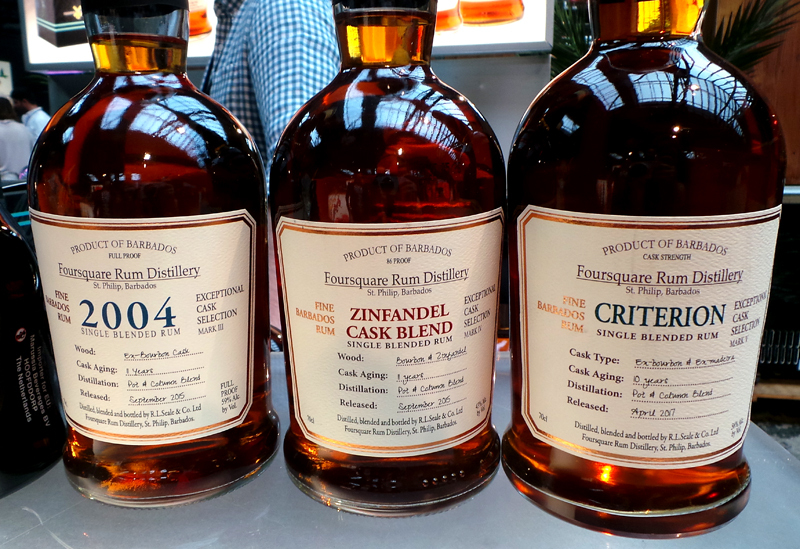 The German Rum Awards are a competition in which professionals blind taste the rums submitted and make subjective, yet neutral assessments to a points awarding system where each juror only has to make one mark within a particular scale. This enables the juror to focus on the essentials – without the distraction of having to figure out how many available points to award. 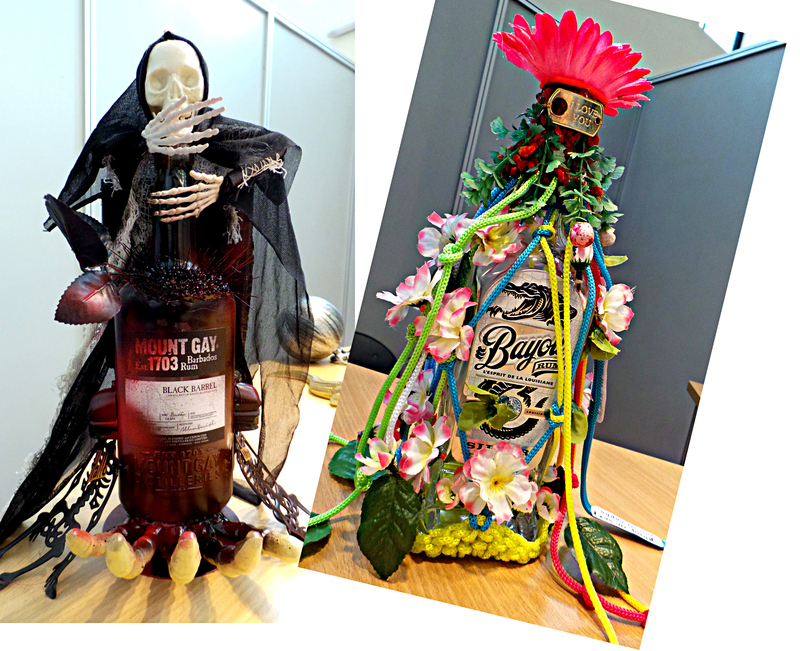 An international jury will taste all submitted rums in a two-day evaluation process. The flights are divided into categories, e.g. 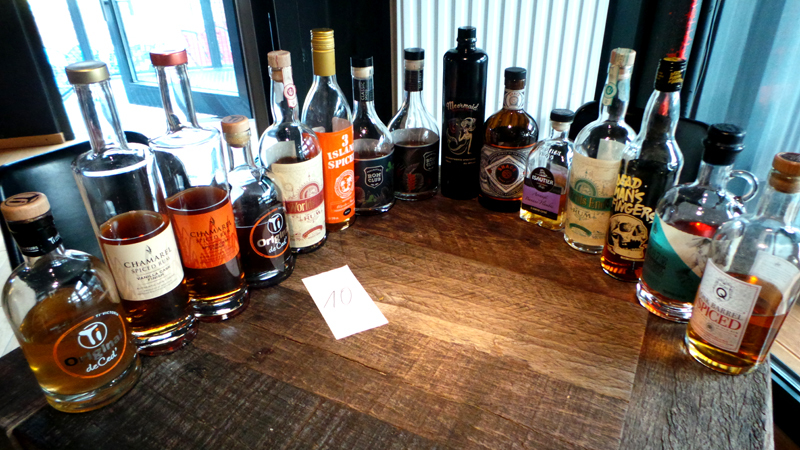 Special Cask, Single-Cask, Agricole VS/VSOP, Overproof, Spiced Rum, No-Age-Statement, Cachaça aged etc etc. 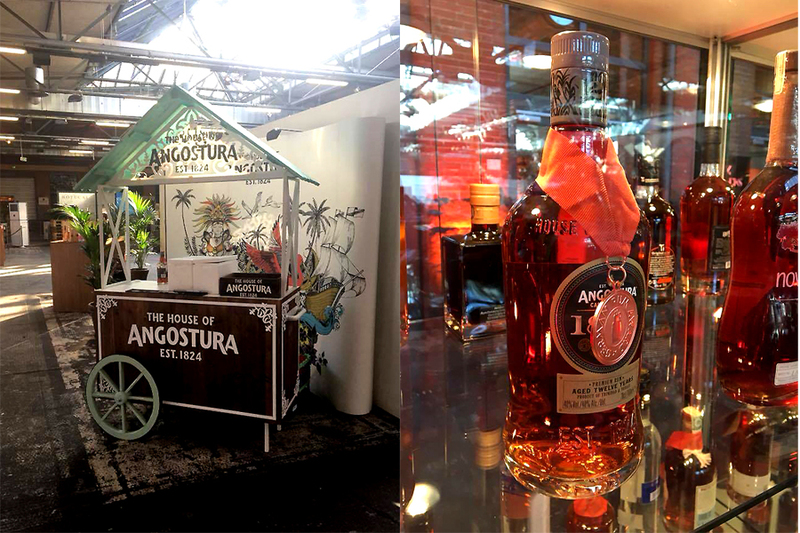 In total 18 categories, around 160 different rums and cachacas. 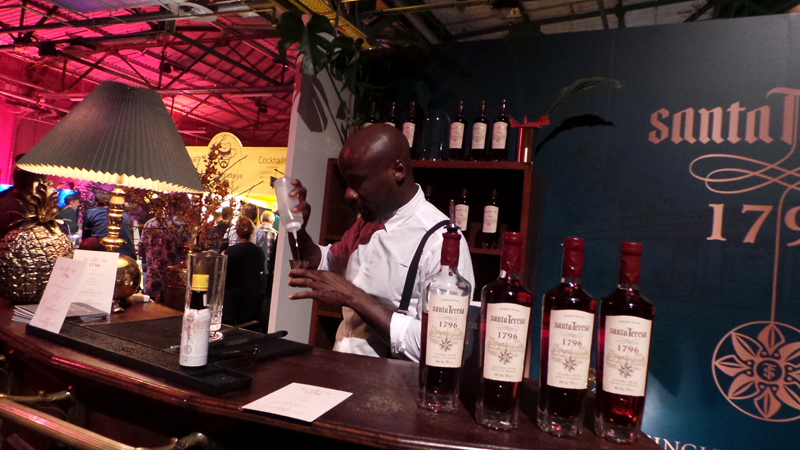 The jury’s conducts the tasting blind at a quiet location and rates the rums according to a point system. In order for a submitted product to be awarded and to receive a medal, a specific number of points must be achieved. The jury awards only one gold, silver and bronze medal in each category, which is different from many other competitions. 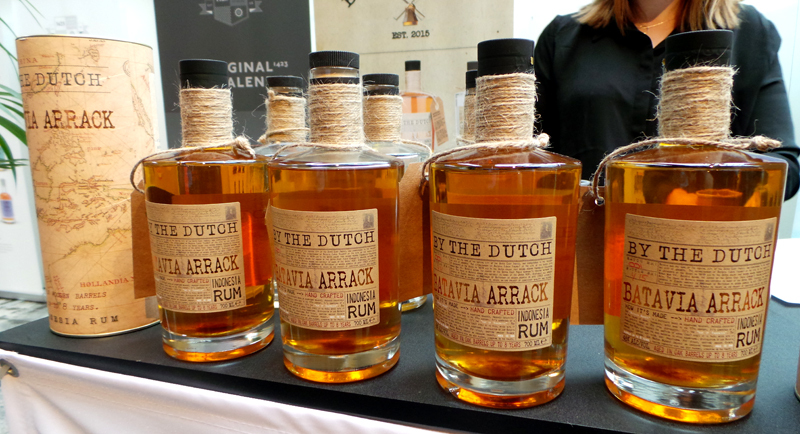 Out of all the submitted products, there is also a “Best in Show“ award – it goes to the rum with the highest number of points, regardless of category. 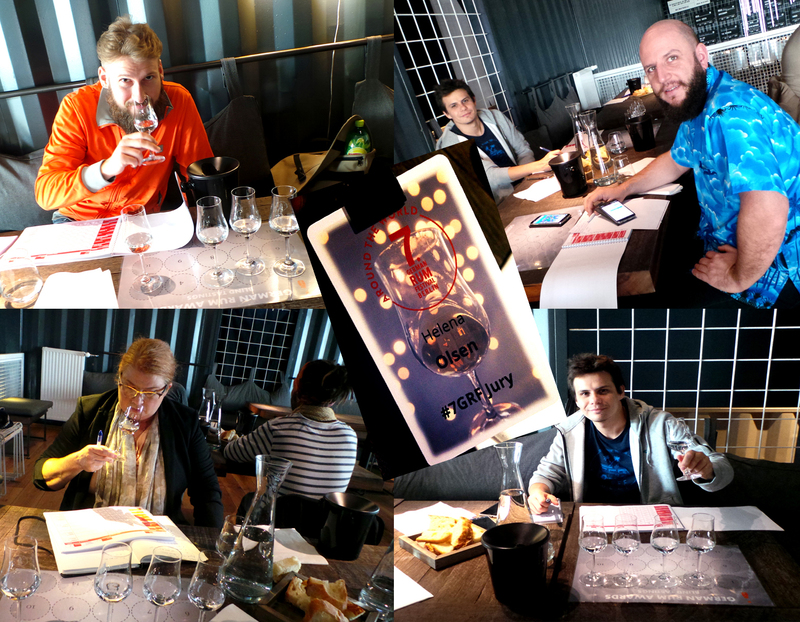 This years results of the tasting competiton is here. 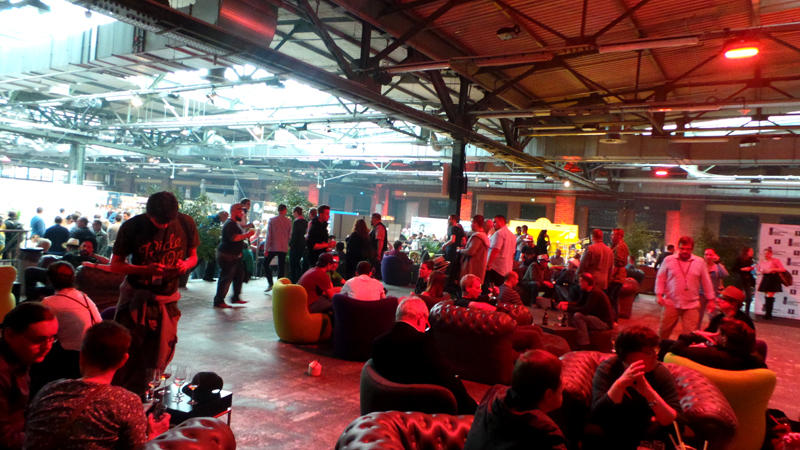 The venue for the rumfest, the Station Berlin is very large with high ceilings making it very roomy and that is needed with such a large crowd of people, it was still hot at the back of the room! I had a great experience in Berlin and hope to be back! 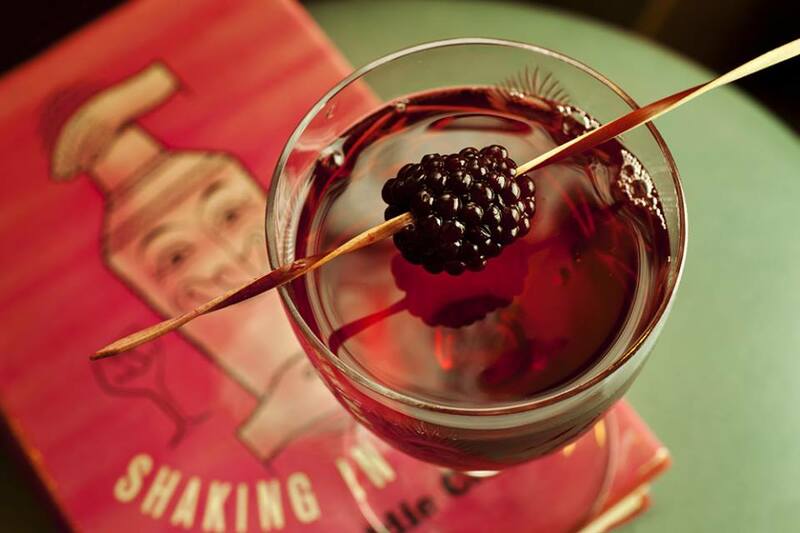 Well crafted tasty cocktails and fun with the rum family at the June Bar with Baba au Rum! 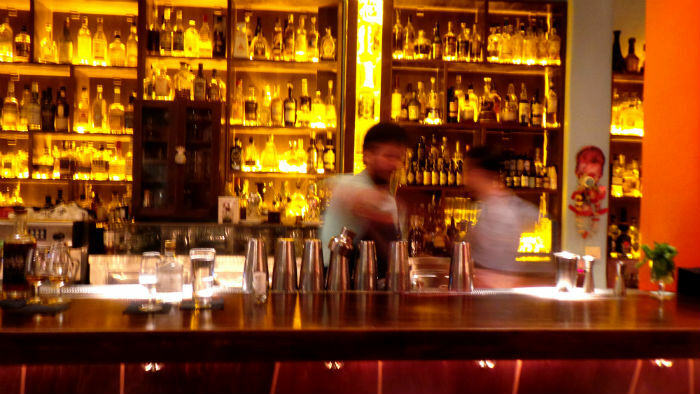 who came among the 50 Best Bars again this year. 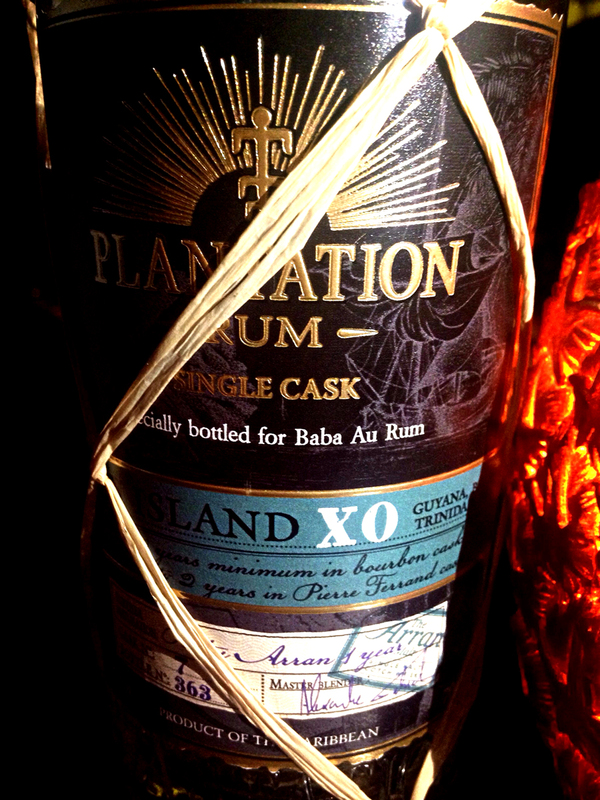 Plantation Rum made for Baba au Rum, a multi island rum aged in bourbon oak, cognac barrels and peaty whisky barrels… It had an exceptionally fine and balanced flavor. 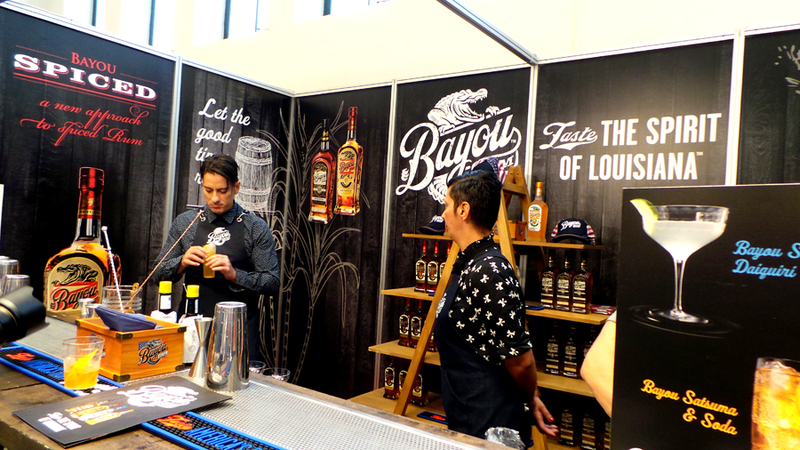 And then….the next day, time for work, rum judging at the BRLO Brewhouse. 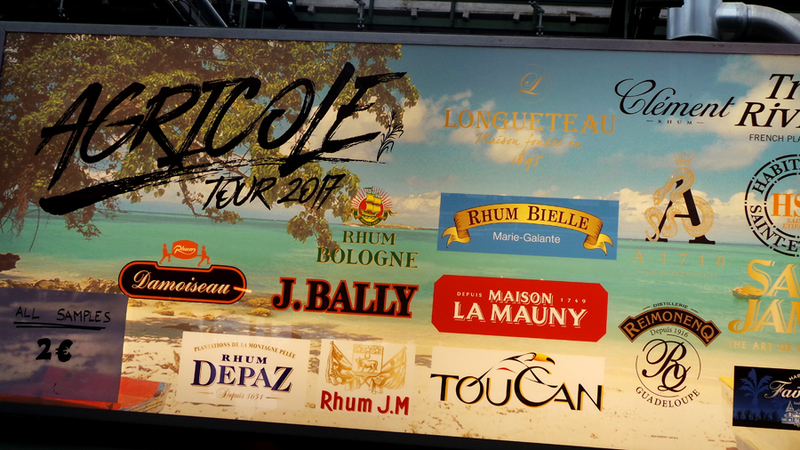 There were many rums to taste for two days, around 160 different rums. 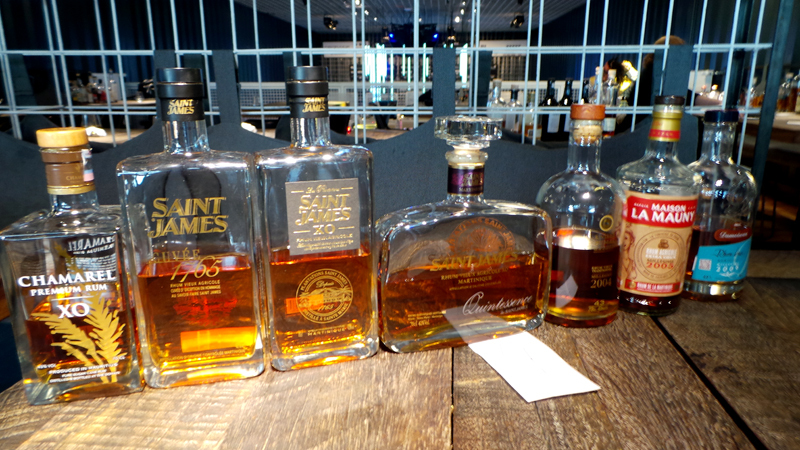 And when the tasting was done, they revealed the rums to us. And this is where it gets really interesting because now you can compare your own notes and the points you gave to see which rums they were. After this was done we went for a brewery tour at the BRLO Brewhouse which I think had a pretty cool sign on the wall. 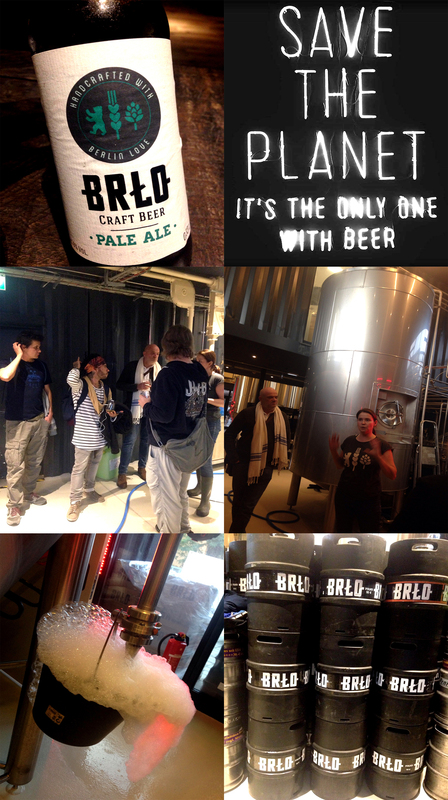 BRLO is the slavic origin of the name Berlin.The beers made here are really tasty! they make handcrafted beers in small batches and they do not filter the brews to keep all healthy nutrients. From December and onwards you can visit them at their brewery and restaurant. And this is located in a one of a kind building constructed from 38 shipping containers! 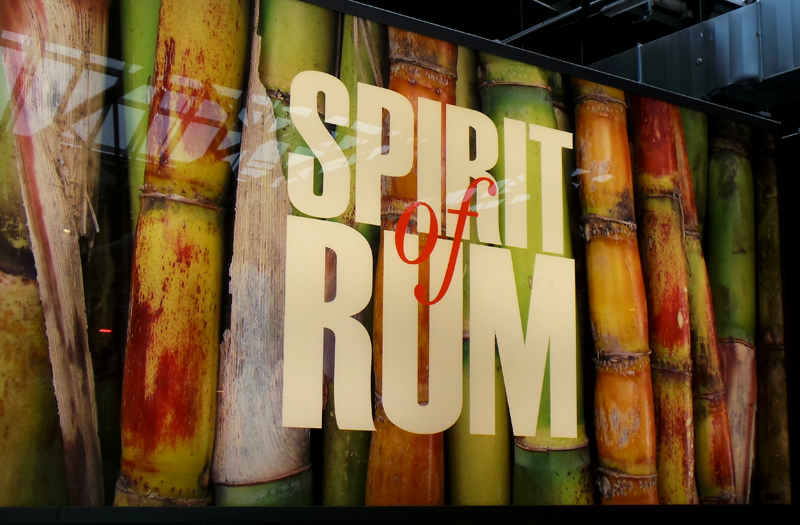 The next day….time for the rumfest! 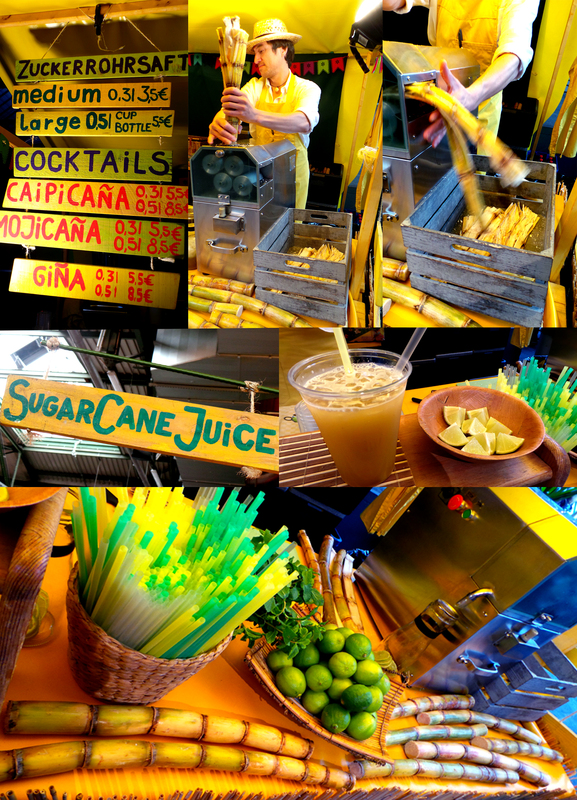 and what is better than starting a rumfest with some freshly pressed sugarcane juice? (by Mr Zuckerrohr) in which, you a bit later add some rum…. 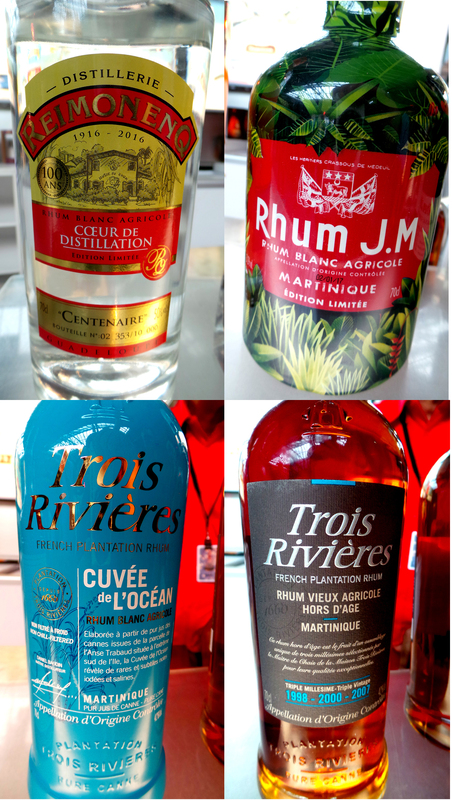 There were quite a bit of rhum agricoles to try (to my joy) since my favorite rum categories are cask strength molasses based rums and agricole rums. And who is happier to show you these rhums than Jerry Gitany? 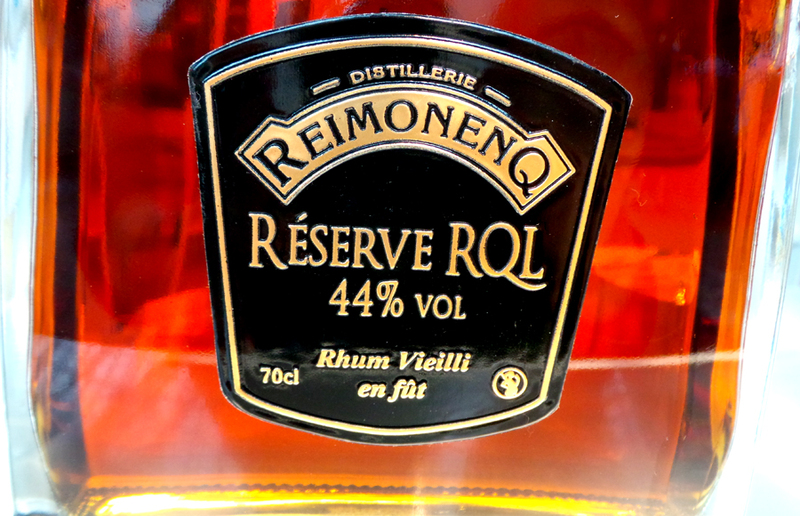 Complex and aromatic, Reimonenq Rhum Vieux Réserve RQL from Guadeloupe, aged in bourbon and Cognac casks. 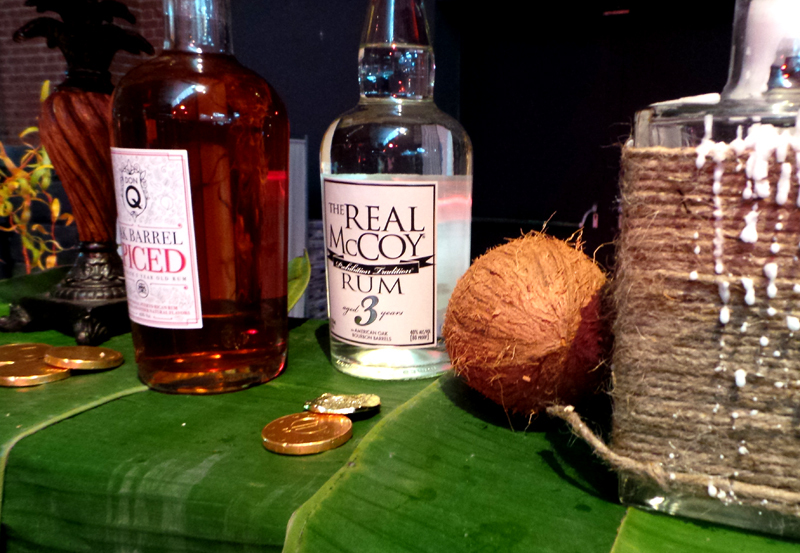 And what is a rumfest without some Real mcCoy and Don Q rums and coconuts? 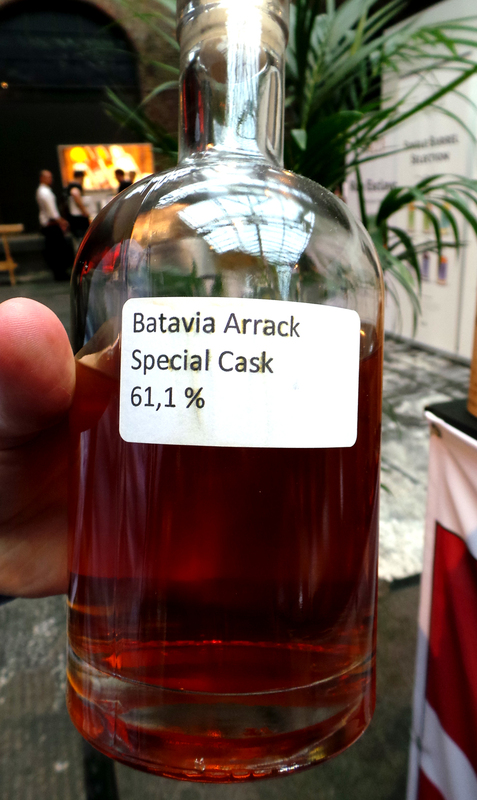 And a special cask….which I hope they will offer for sale in the future. 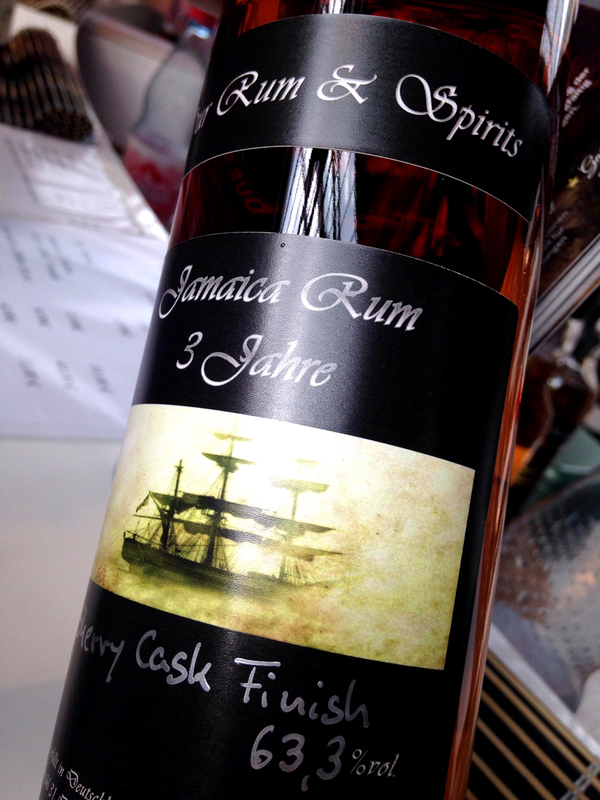 This one brought my mind to the flavorful high ester rums from Hampden. 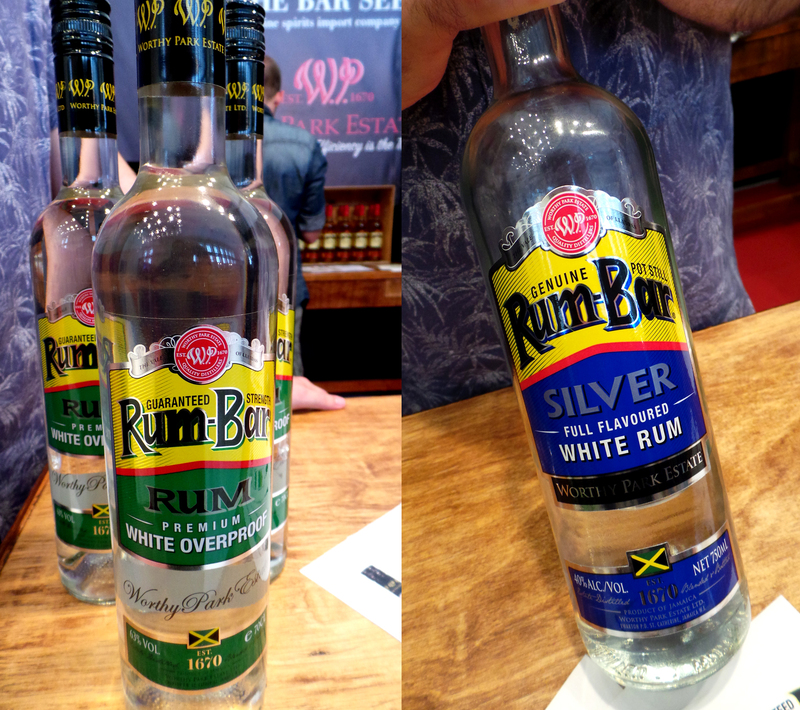 And there`s more interesting rums in the works…something for us rumlovers to look forward to! By Foursquare. 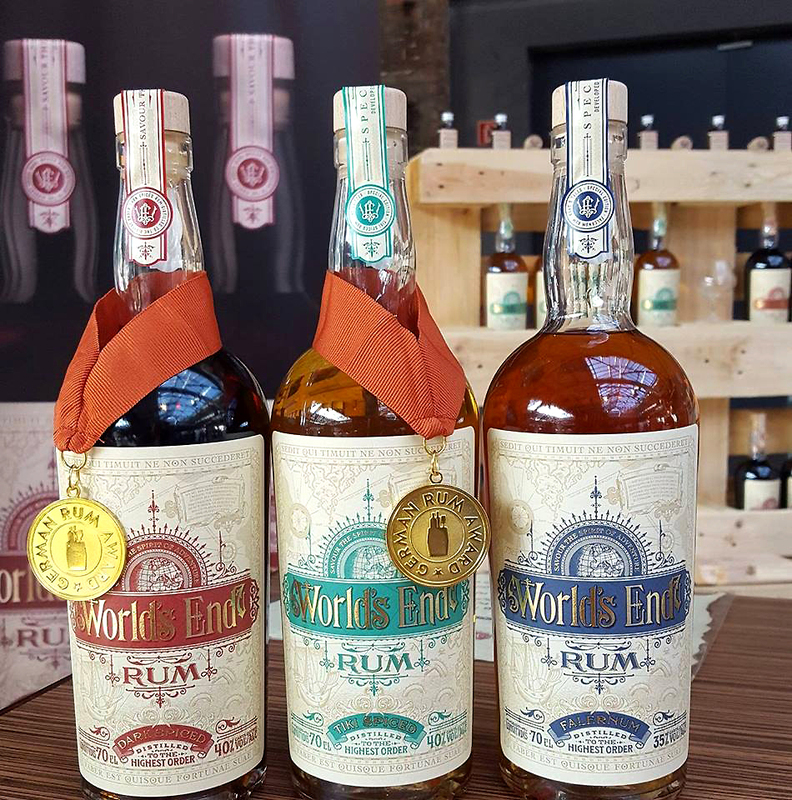 Always reliable when it comes to the quality, nothing added to these rums, they are exactly what they say they are and they do taste good! A popular place to be…. And so was this! 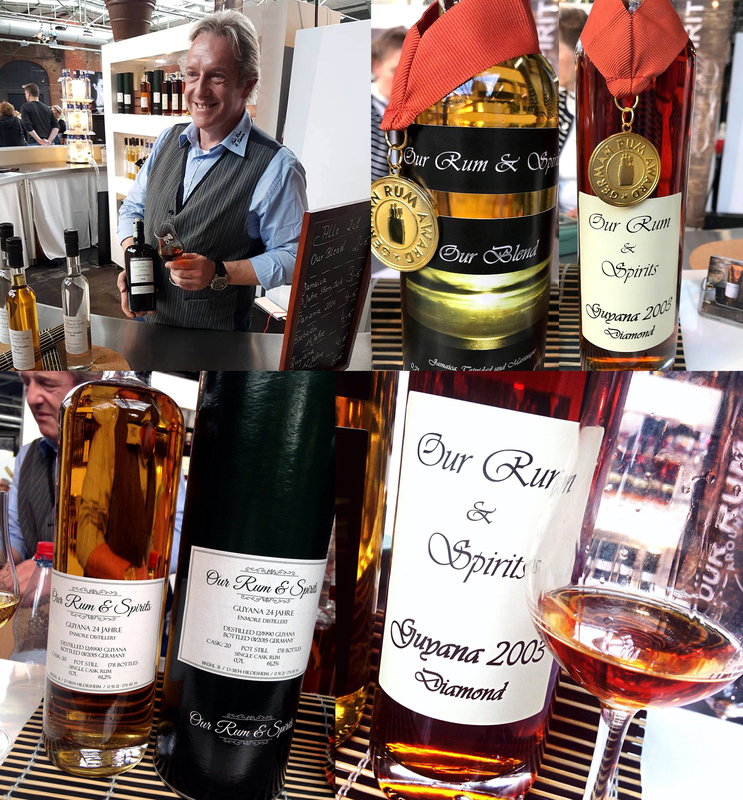 Our Rums and Spirits booth with the rum that was my favorite, the “Guyana 2003 Diamond” at 63,7% which together with the “Our Blend Jamaica, Trinidad, Martinique” was awarded gold in the categories “Single Barrel” (Guyana 2003) and the “No Age Statement”. Further there was this 24 year old Demerara rum (Enmore) which I have at home 🙂 very tasty too. And their Jamaican, which I also liked very much. 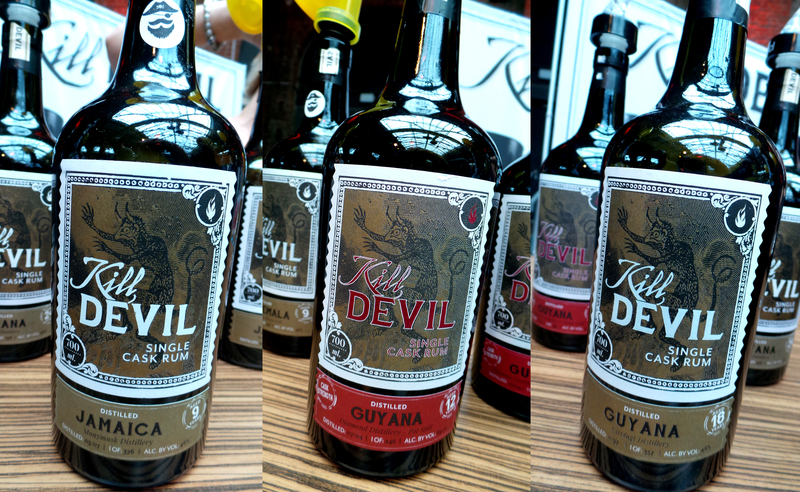 We are into some serious rum drinking now, continuing with the Kill Devil rums, my favorite? the red one in the middle. 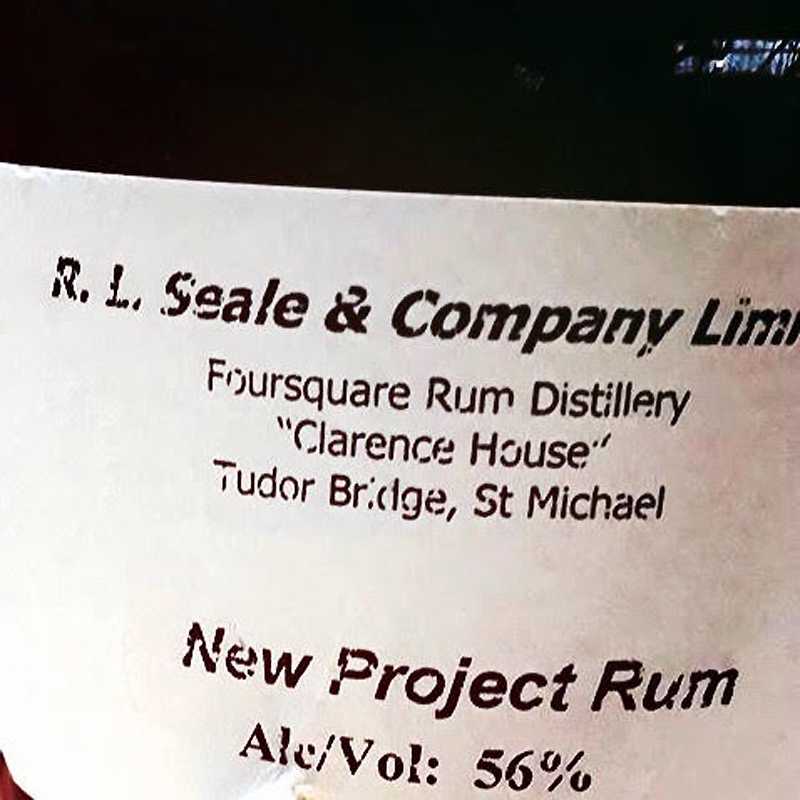 Cask strength (63.1%, Diamond) from Guyana. 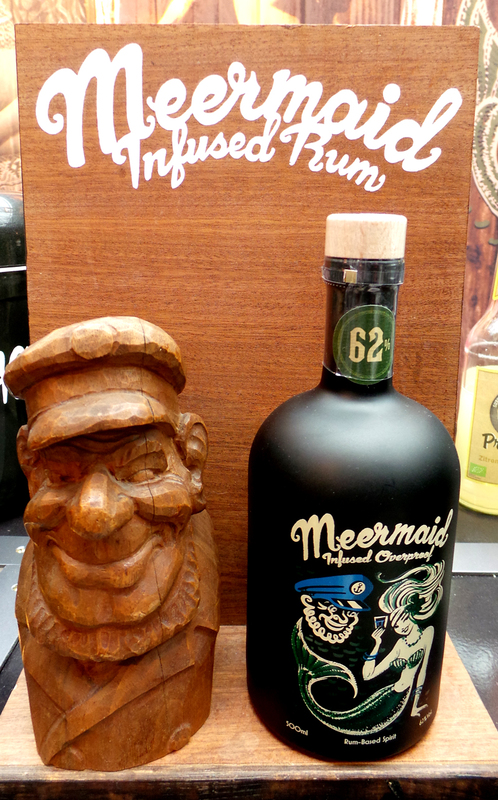 After all these amazing strong rums it was good to change to a rum and chocolate pairing at the World`s End Rum booth….together with a refreshing and very cold cocktail. I spent quite some time here chatting with all the fine folks in and around this booth. 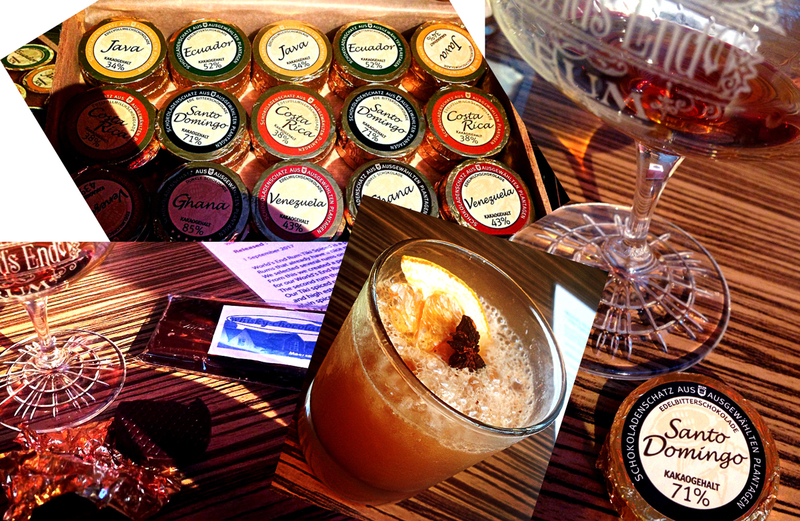 Rum, Rhum, Ron…that`s what we are here for. 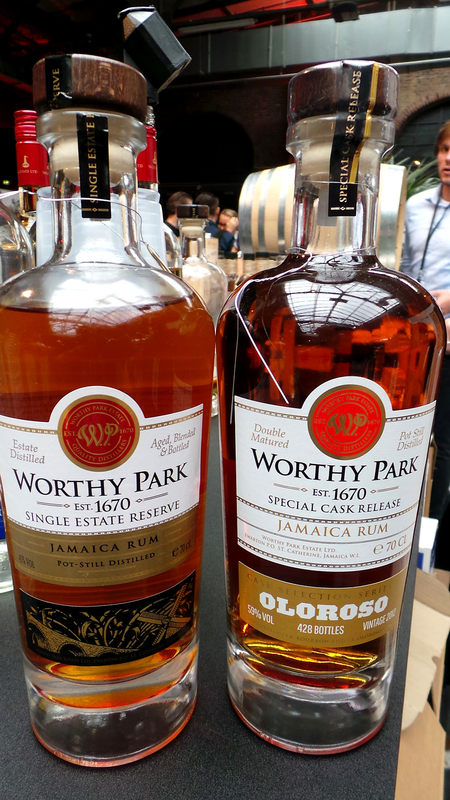 Fine rums from Worthy Park, Jamaica and I really liked the Oloroso! 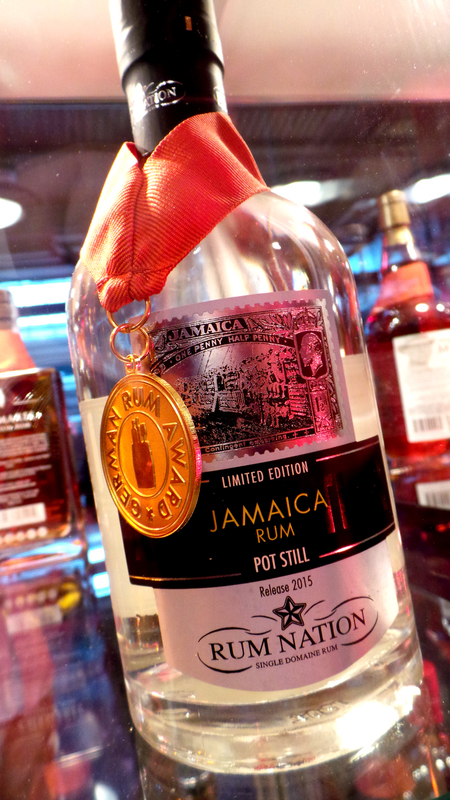 And another fine overproof, Rum Nation Jamaica which won the overproof category. 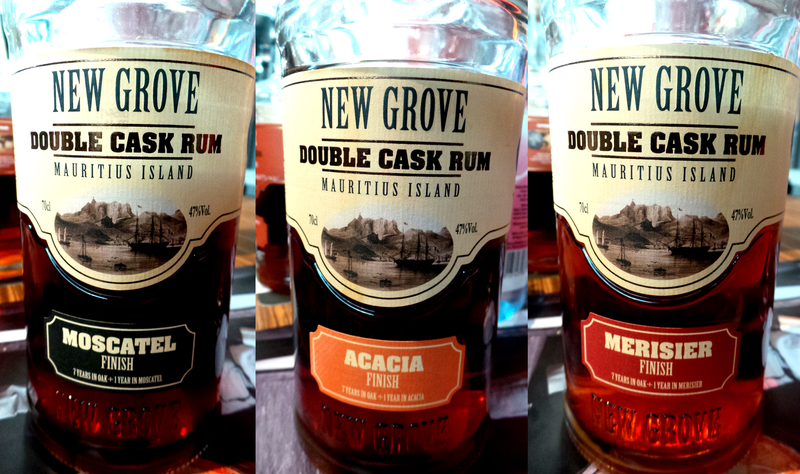 These three expressions from New Grove Rums from Mauritius are tropically aged and made from molasses with ageing in different woods. 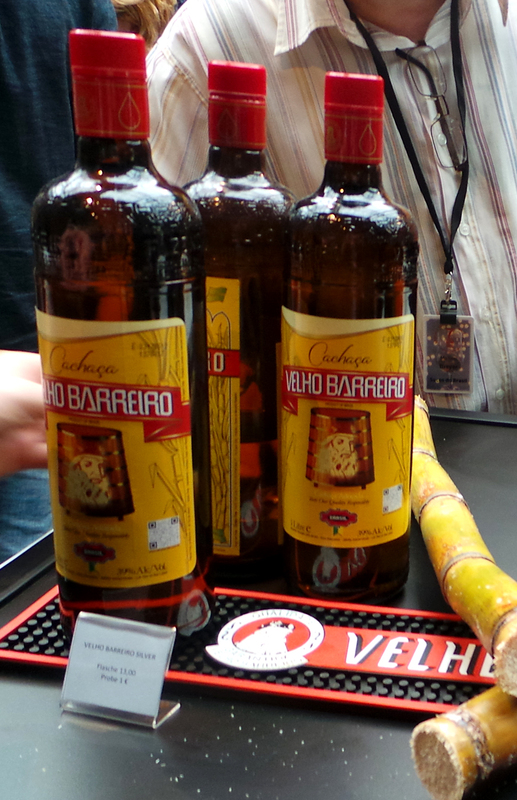 And Velho Barreiro Cachaca from Brazil. 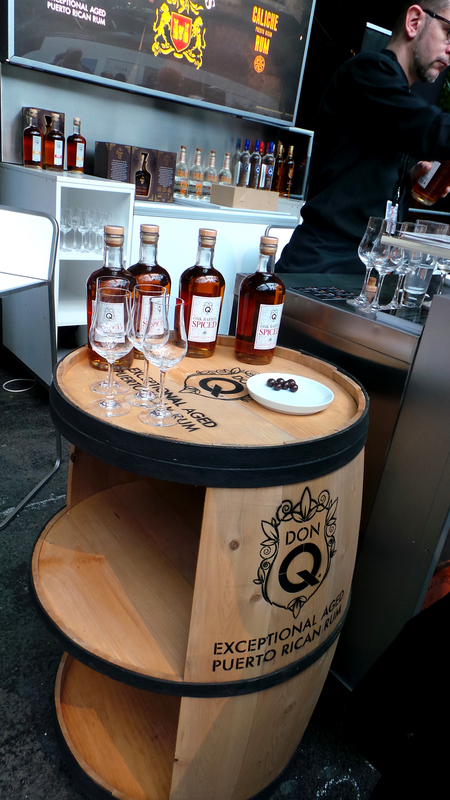 Don Q, of course! representing Puerto Rico. 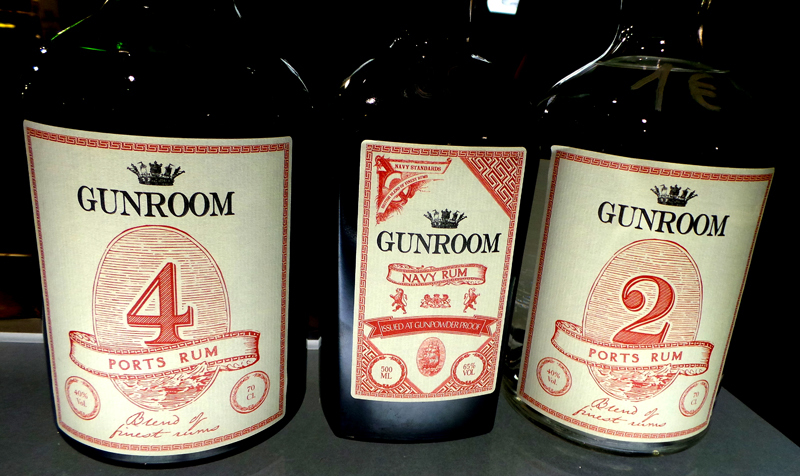 And from Sweden, the Gun Room Rum from Renbjer and Magnusson. 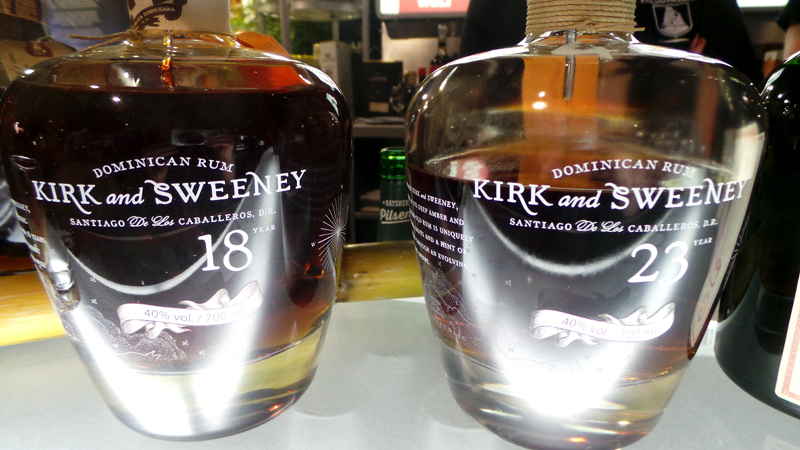 Kirk and Sweeney is a rum from the Dominican Republic which have taken their name from the name of a wooden schooner that was best known for smuggling rum from the Caribbean to the United States during Prohibition. 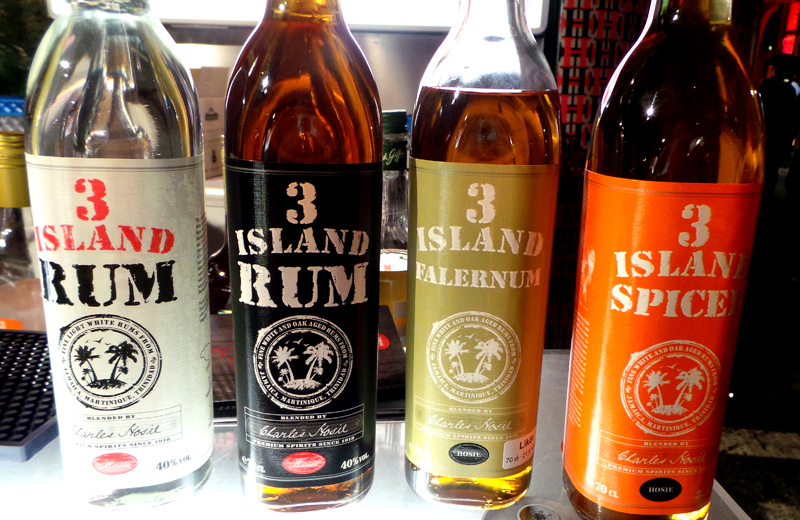 3 Island Rum is a brand of rum that was launched in the beginning of 2013 by Charles Hosie, the firm of spirits importers and founded in Hamburg 1918. 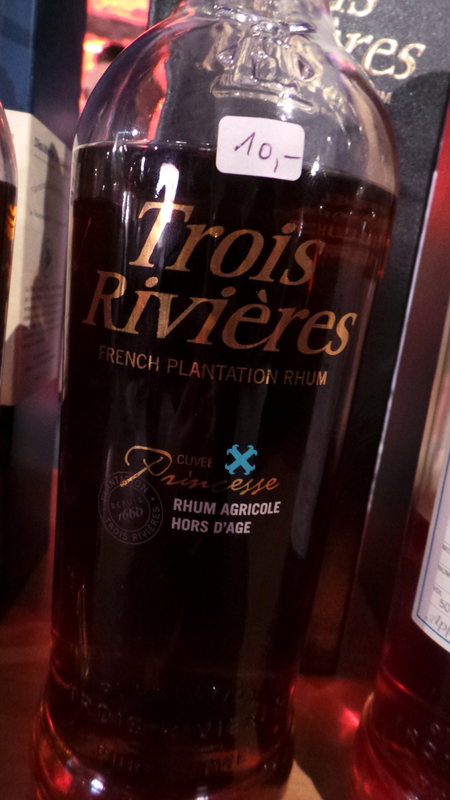 Aged rhum agricole by Trois Rivières. 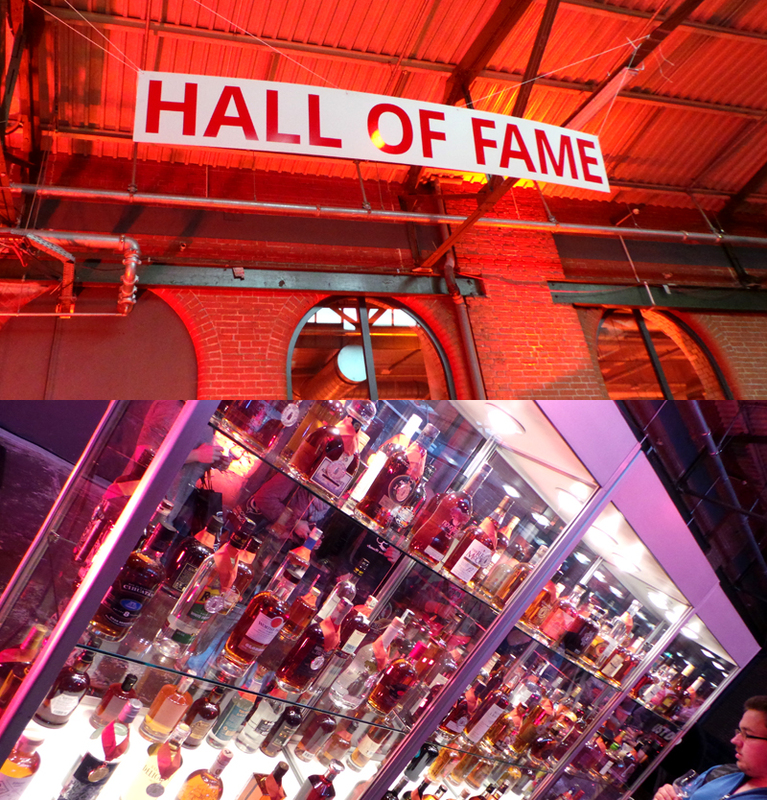 The Hall of Fame where you could see all the award winning rums. Ti Arrangèes de Cèd, rhum arrangè which is something I find cool to use instead of simple syrup in tiki drinks…a way to use it that is not the traditional way which is sipping it, which btw is good too and typical French island tradition. Santa Teresa 1796, hailing from Venezuela. 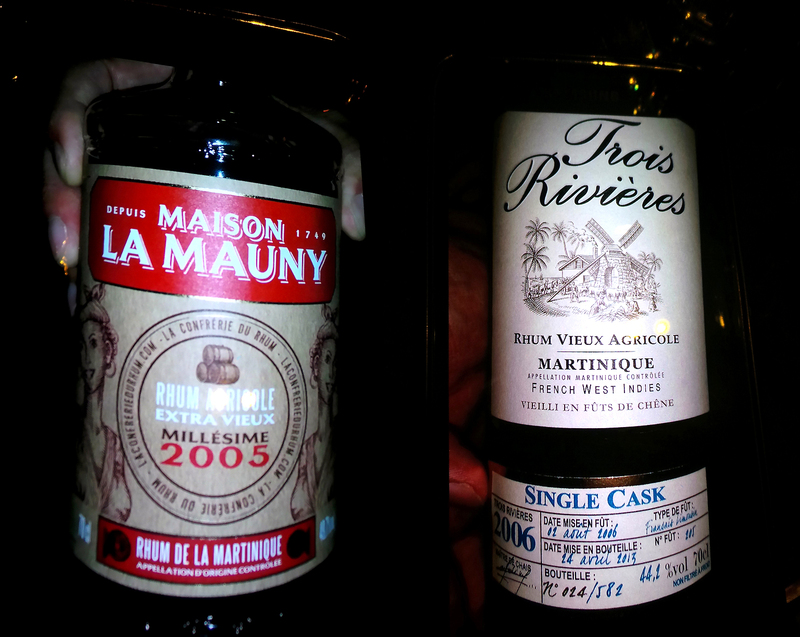 More rum after the rum judging…and the BRLQ Brewery tour – we went to a masterclass/tasting of La Mauny and Trois Rivières rhum at the Stairs Bar held by Daniel Baudin, cellar master of La Mauny & Trois-Rivières. 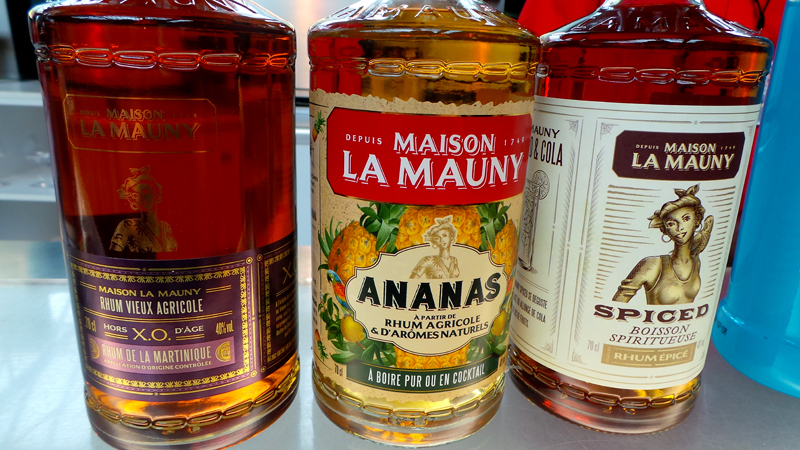 These are some very good agricole rums! And now I think you`ve had enough of my “blurs” and pics and I finish with a picture of the Tempodrom which is located right beside the hotel Crowne Plaza. 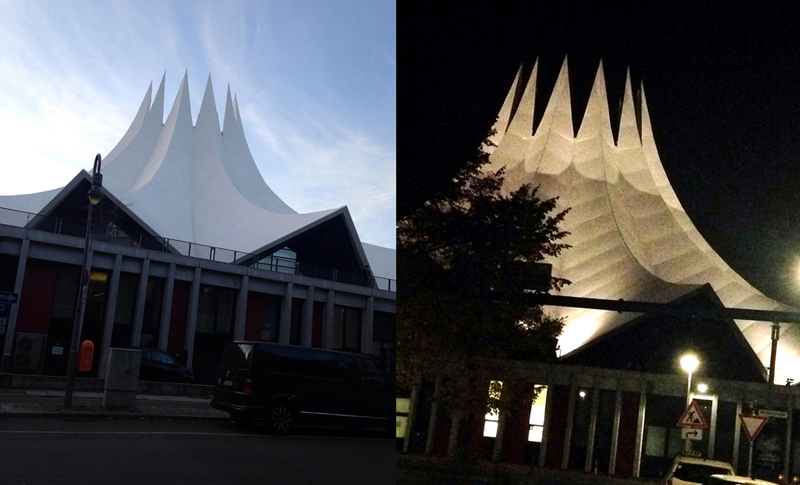 The Tempodrom is an event venue that was founded by Irene Moessinger, and opened in 1980 next to the Berlin Wall on the west side of Potsdamer Platz, housed in a large circus tent. Thank you Berlin for having me! hope to be back the next year! 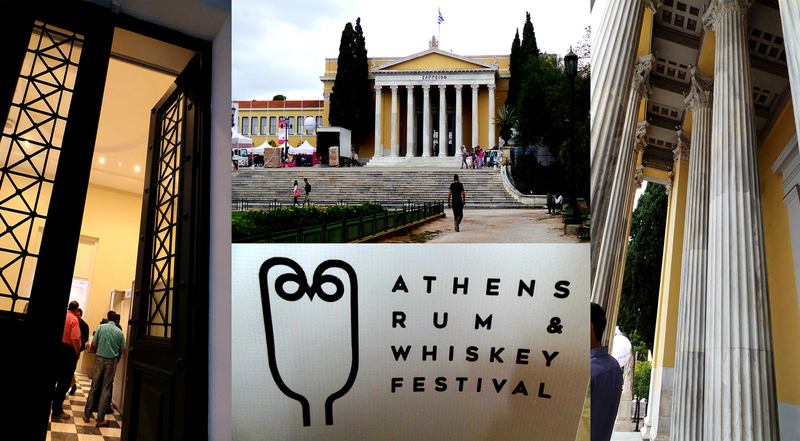 This was the second rum festival in Athens (rum and whiskey together this year) but my first time to attend the event which was taking place in the impressive neo-classical Zappeion Hall, built in 1878 which also is conveniently located near the beautiful park, the National Gardens around the city center with two metro stations nearby. The festival was small but sweet…with a good vibe – and drunken crowds, thankfully, I did not see. Nice and relaxed! 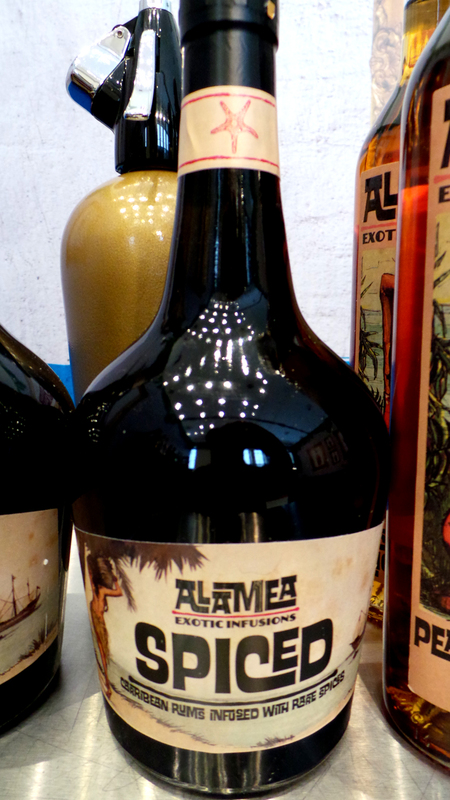 I stumbled on some rums I’ve never tried before too and to my pleasant surprise the Alamea Exotic Infusions that are soon to be launched at the Berlin Bar Convent on october 10-11 by Daniele Dalla Pola were there as well. Read more about Alamea here in my review. They made some very nice cocktails with it and I really enjoyed having drinks with the Alamea. There were cocktails made in most booths plus there was a little Baba au Rum pop-up booth there as well so one could choose to both sip rum and whiskey neat but also get to drink very nice cocktails which I appreciated! 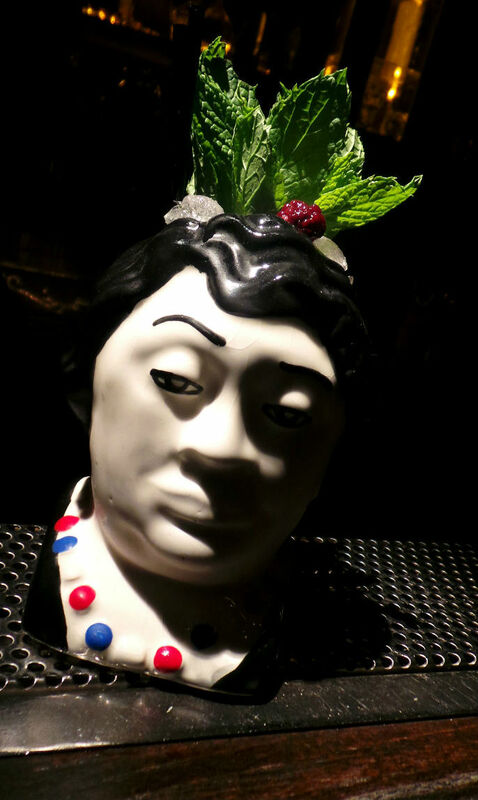 Baba au Rum once again came among the 50 best bars – this time no.30! so again I say congrats to the Baba team! was it only a couple days ago I was there? someone fly me back please! 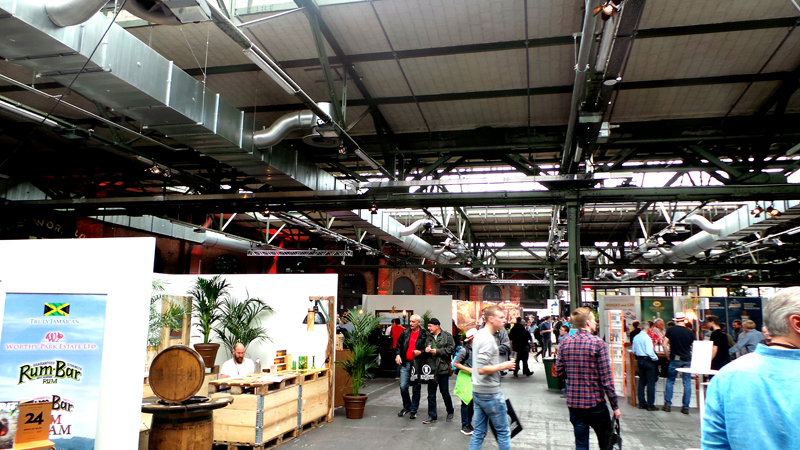 but then again – they will have a pop up bar in Berlin in a few days….during the BCB (Bar Convent Berlin) and the German Rumfest and I`m luckily heading in that direction. 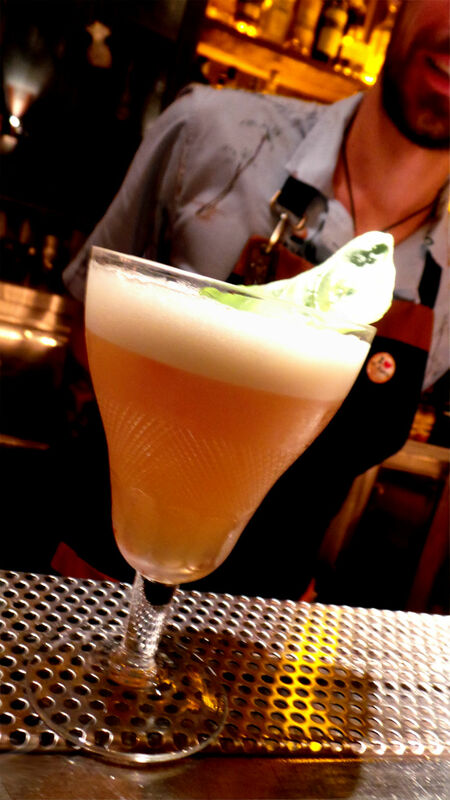 As for bars in the city, Athens have a very vibrant bar scene with worldclass bartenders and a hospitality next to none! they really are that good! 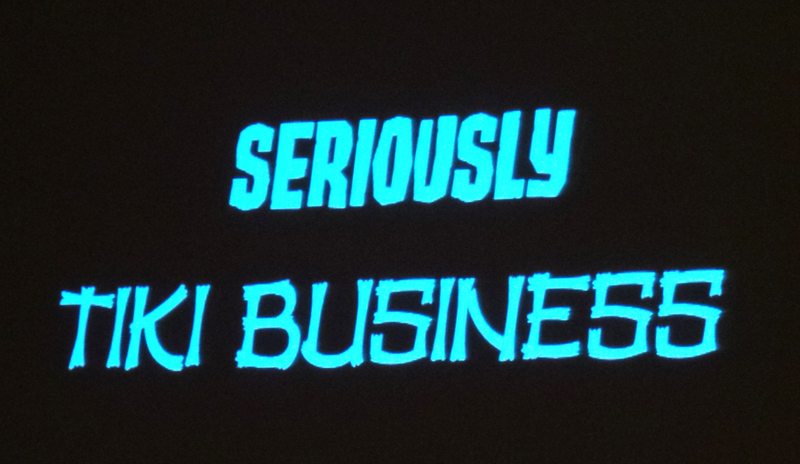 but I already said that before…and not only do they make great cocktails in the bars but they also play very good music! You are guaranteed to have fun! 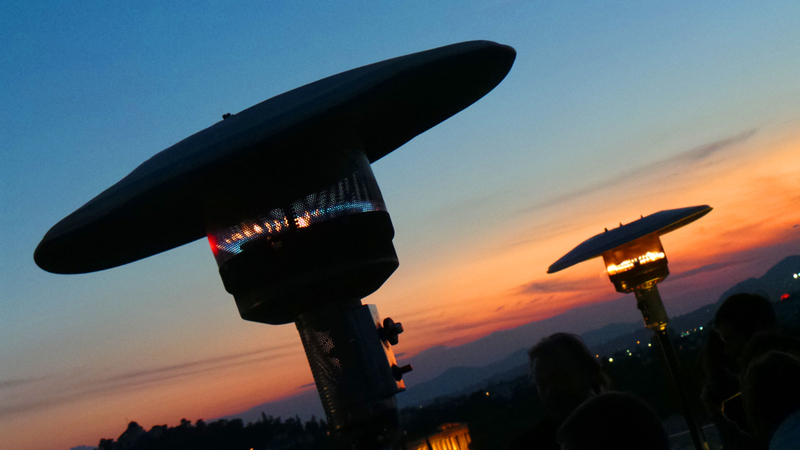 also, the rooftop bars….the views are incredible. 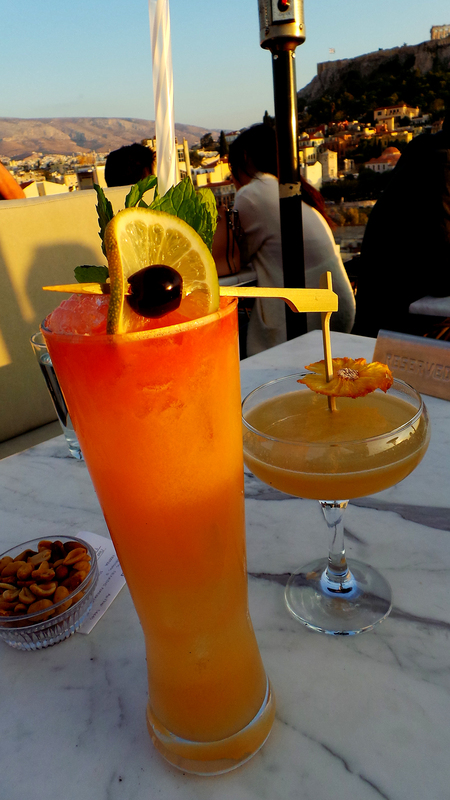 A few great bars to mention are Baba au Rum, Speakeasy, Gin Joint, Clumsies, Kolokotroni 9, Bank Job, Rabbit Hole and the seasonal Mary Pickford by the water in Piraeus (awesome rooftop bar with a great view of the water and all the boats, plus great food, drinks and music), and then the rooftop bar at the hotel “A for Athens” with an unrivaled view and occasion to see the sunset over the city with a stunningly beautiful lit up Panthenon/Acropolis by night….a sight to see I promise! This is a good start for the Athens rumfest which I believe has potential to grow nicely to something really great and I hope to see it happen again next year. Enjoy the rest by pictures! I think they say more than my words! I first discovered in New Orleans during the Tales. 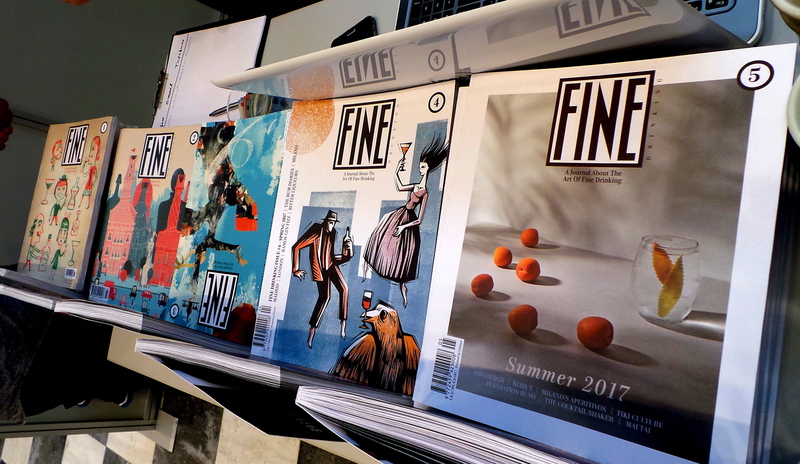 FINE Drinking Magazine, one of the best bar magazines today, get yours here. This was delicious! 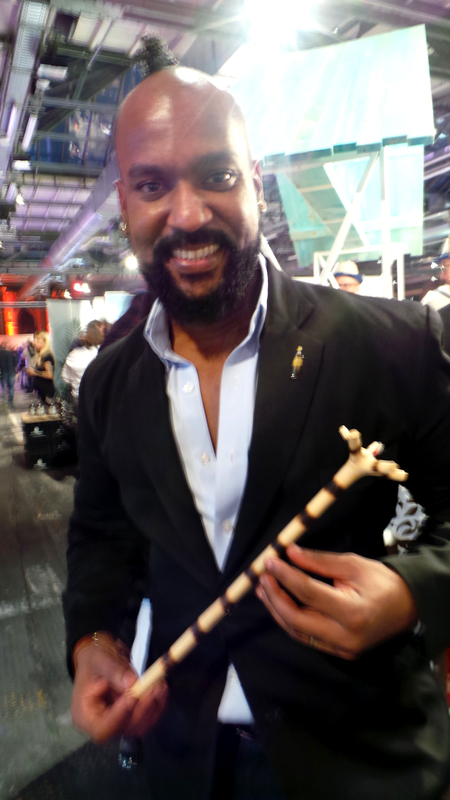 the Cuban Swizzle with Santiago de Cuba Greece rum and Alamea Pimento Liqueur which is with the other Alamea products launched now at the BCB in Berlin and to soon be sold online and shipped worldwide so all the tiki folks and everyone else will be able to get them. 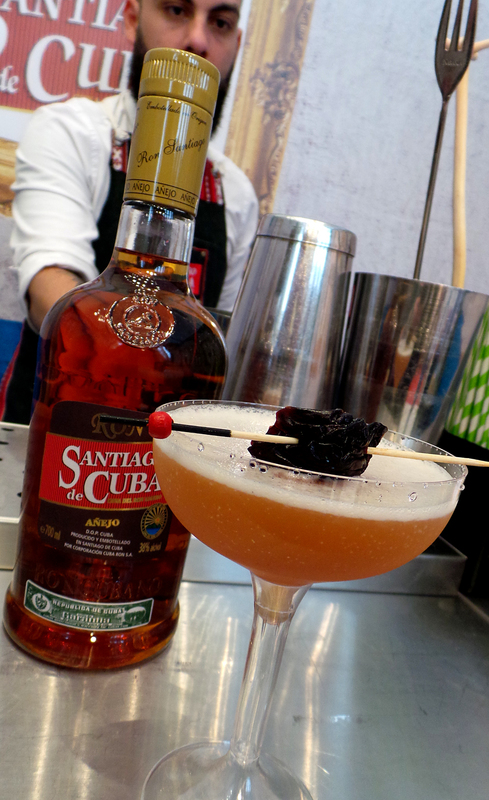 And the Santiago Mulata, with Alamea Hawaiian Coffee Liqueur and the Santiago de Cuba Greece rum. 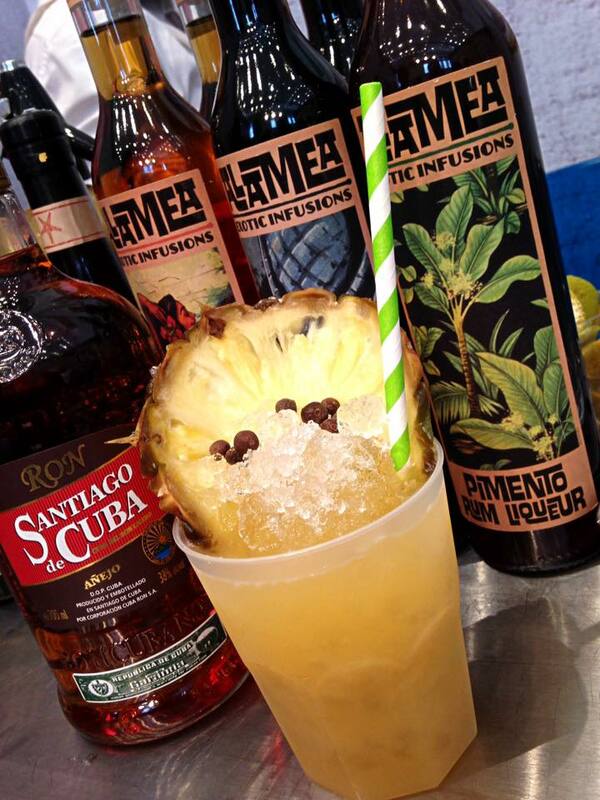 As tasty as the Cuban Swizzle. 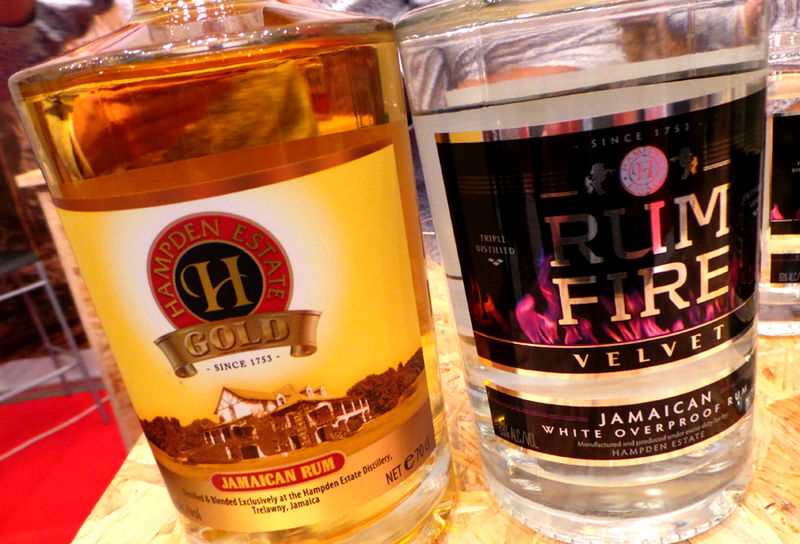 Moving on to some Hampden rums…a favorite brand from Jamaica. RumFire needs no presentation and neither does the Hampden Gold. 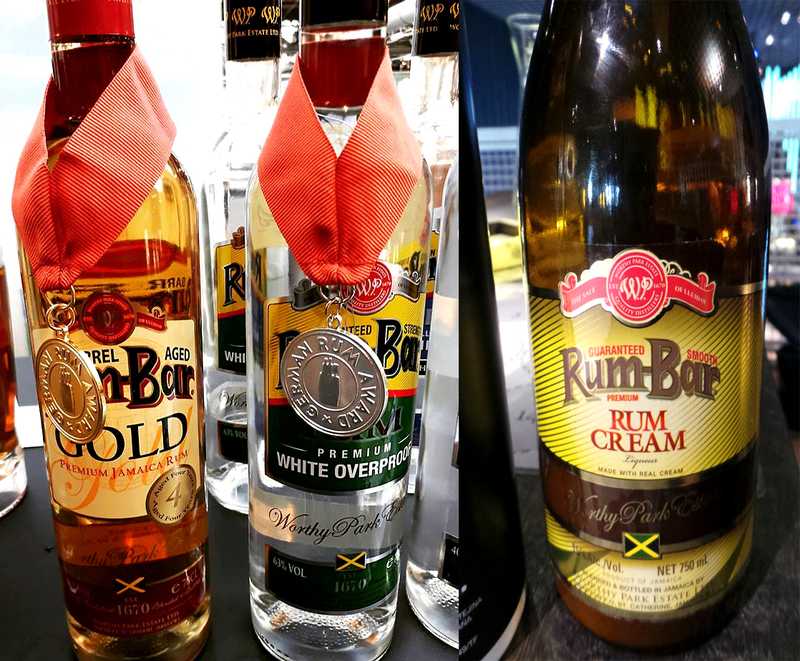 World famous high ester Jamaican rums at it´s best! 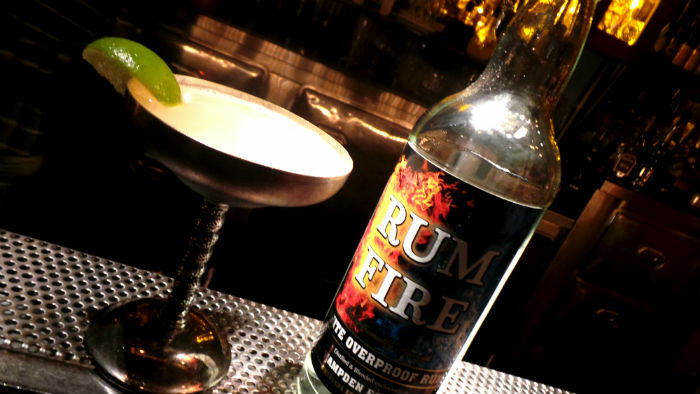 Similar to the RumFire with that typical vegetal grassy and “kerosene”- like flavor notes (but much less up in your face as the JWray), the Rum Bar overproof is a blend of three pot still unaged rums. The Worthy Park Estate have produced sugar and molasses since 1720. 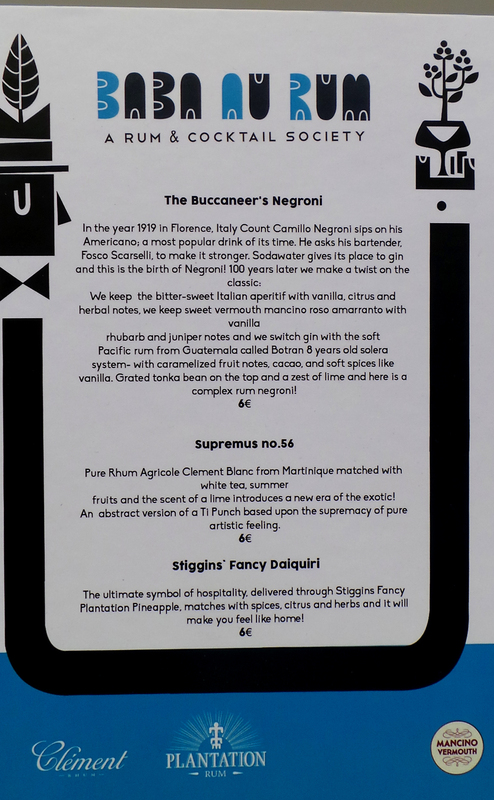 And then a new expression I haven`t seen before with the blue label, called Full Flavored White Rum. 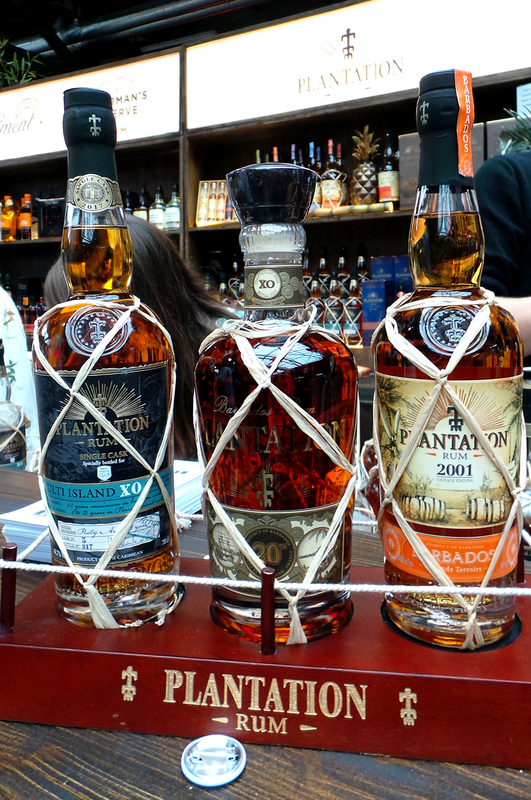 Good rums! Cheers to overproof Jamaican rum! And a daiquiri with it was in order. 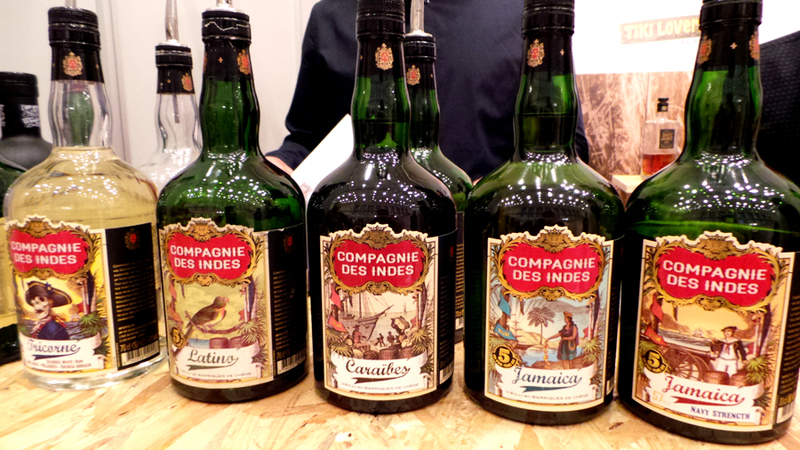 Another rum brand I like, Compagnie de Indes, I wrote about a few of their expressions here. 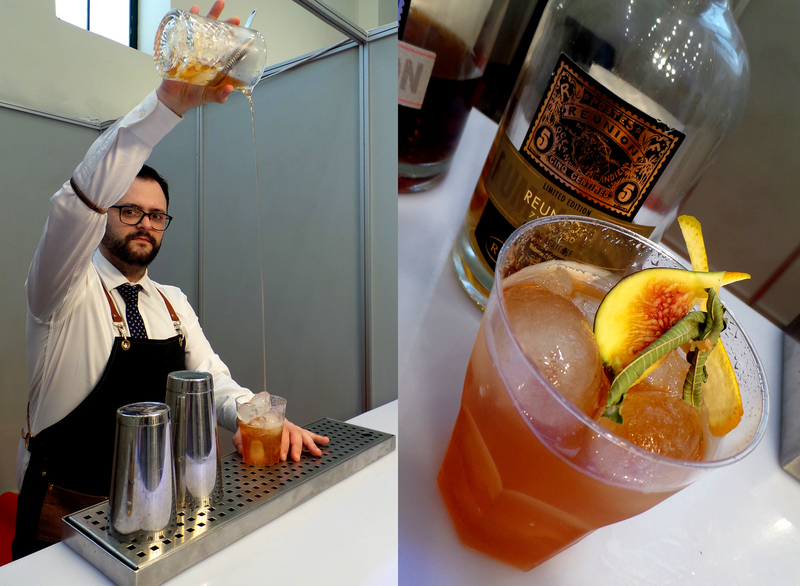 A Mediterranian style Rum Old Fashioned with Rum Nation`s agricole rum from la Rèunion. Beautifully presented and very tasty. 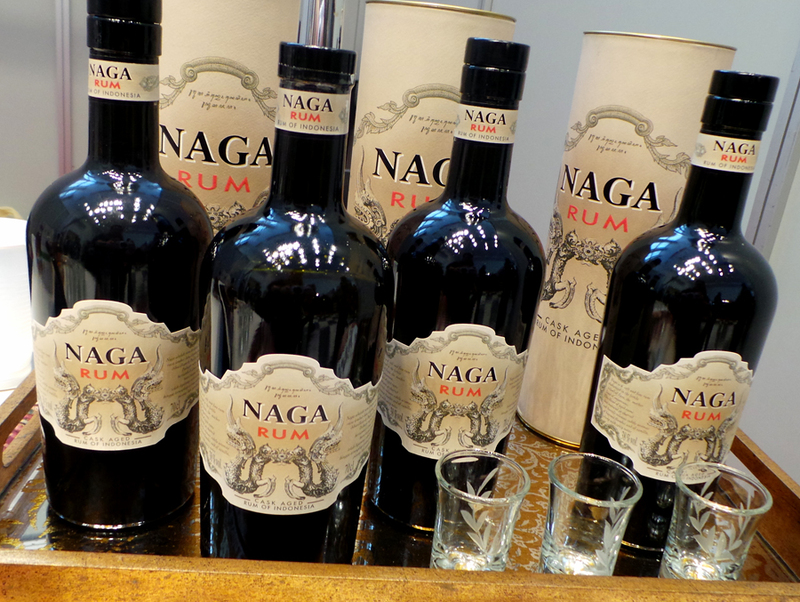 Naga rum from Indonesia, which I think we will see some more of when a certain tiki bartender starts mixing with it 🙂 it had a bit of an interesting funk to it`s flavor which I think would be good in especially tiki drinks. 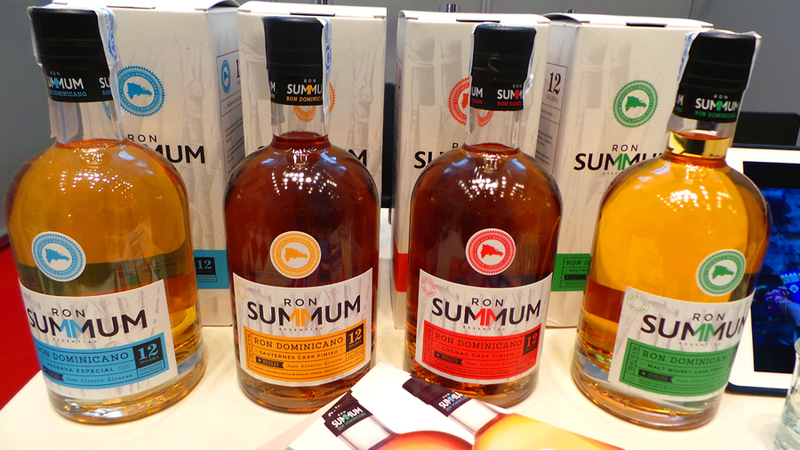 Another rum I had never tried before, Ron SumMum from the Dominican Republic.They come in four expressions – from left to right – the Reserva Especial, the Sauternes Cask Finish, the Cognac Cask Finish and the Malt Whiskey Finish. And Japanese Whisky, Akashi. 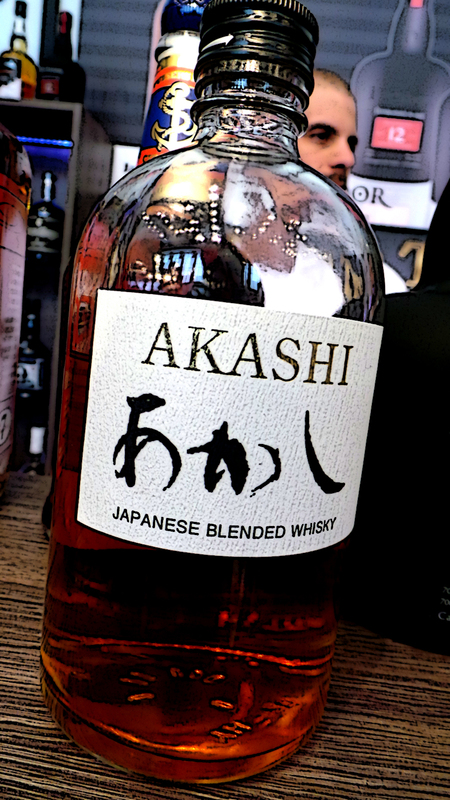 The version of Akashi produced for the European market using a mixture of Japanese and foreign-made malt and grain whisky.The Japanese version has malt whisky and molasses spirit, which would not be classed as ‘whisky’ in the EU. I hope that will change! 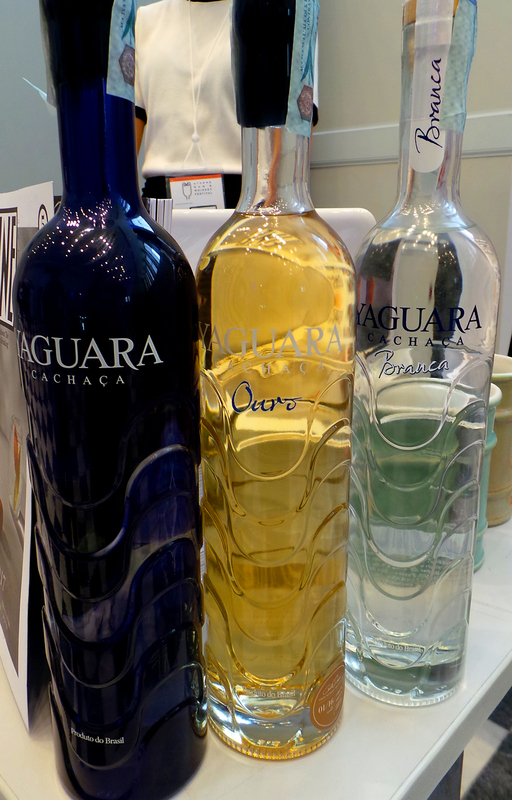 so we can see more artisanal cachacas outside of Brazil! 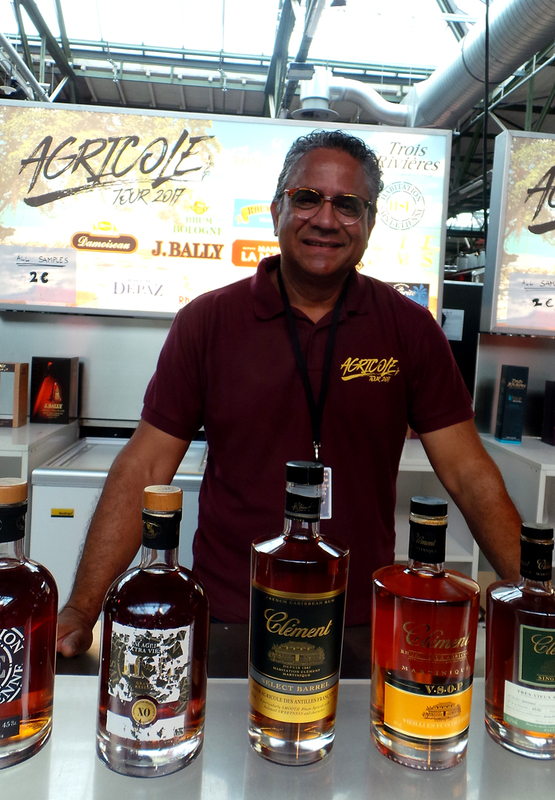 it´s an interesting spirit and very much alike the rhum agricole but yet so different. 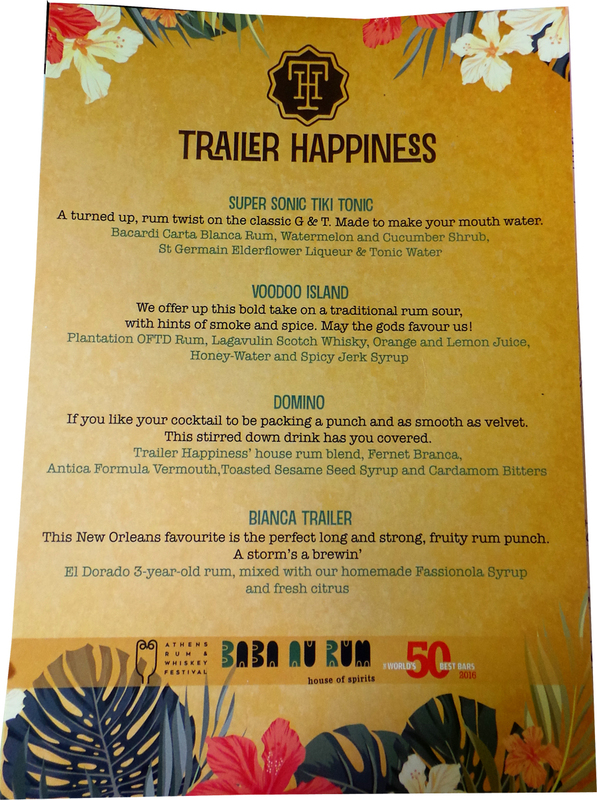 The menu from Trailer Happiness at their pop up at Baba au Rum. 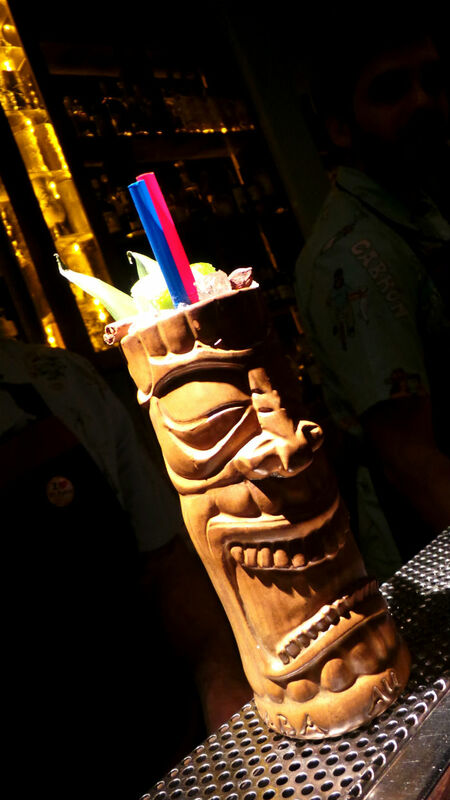 I especially liked the flavor and spicy kick of the jerk spiced Voodoo Island, both frutiy, spicy and smoky. 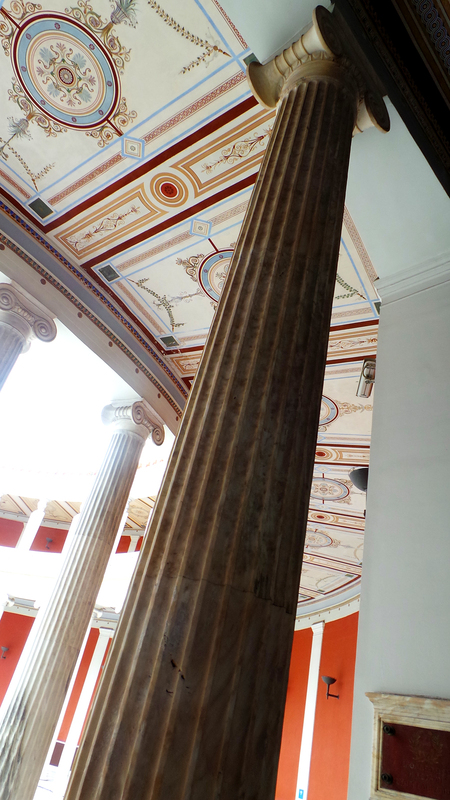 The view from the stairs of Zappeon. 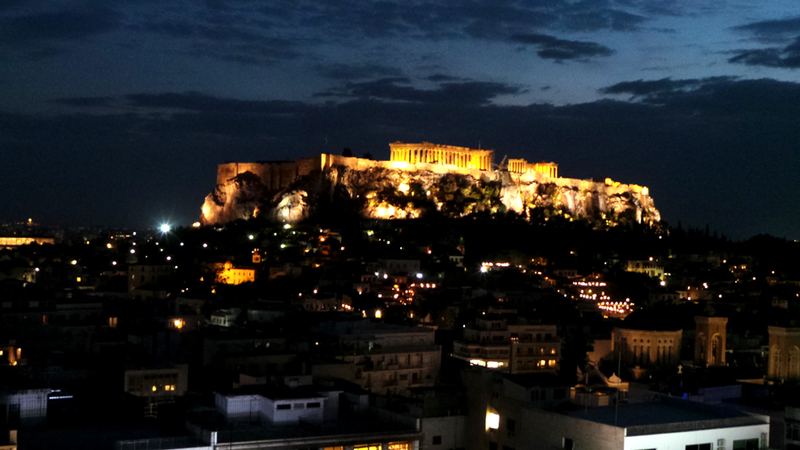 The Parthenon temple on the Acropolis, built in 447 BC when the Athenian Empire was at the peak of its power, seen from the rooftop bar at the “A for Athens” hotel cocktail bar. When you see it like that at night, it`s really magic, it adds a certain feel of the past to the present. And of course it´s stunningly beautiful, pictures does not do it justice. 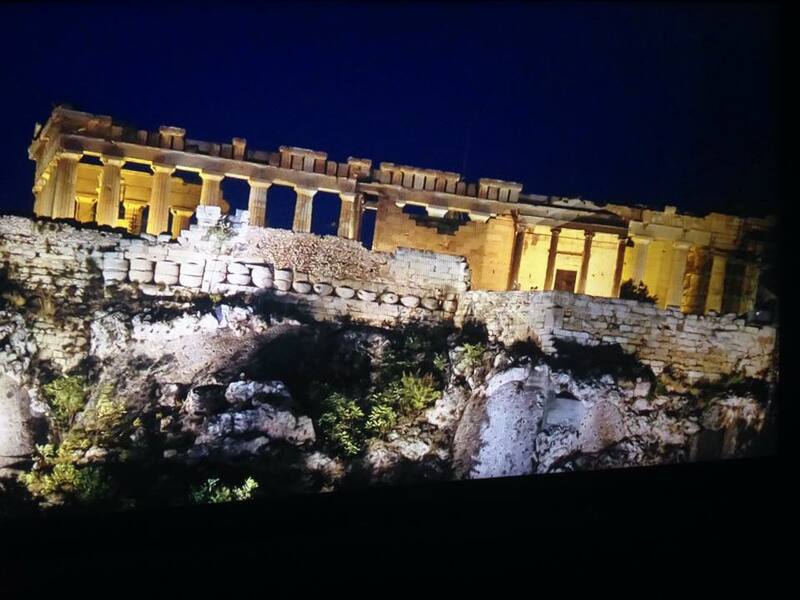 The Parthenon/Acropolis lit up to spread magic and beauty. 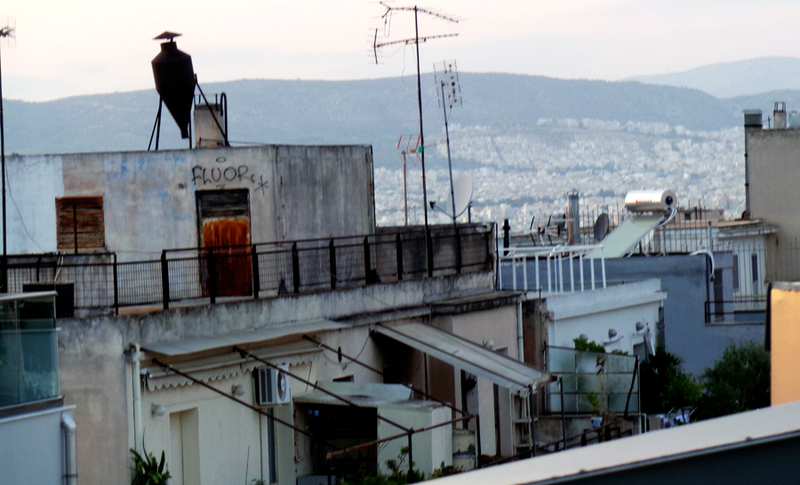 And the view in daylight from the rooftop restaurant at the Astor hotel. 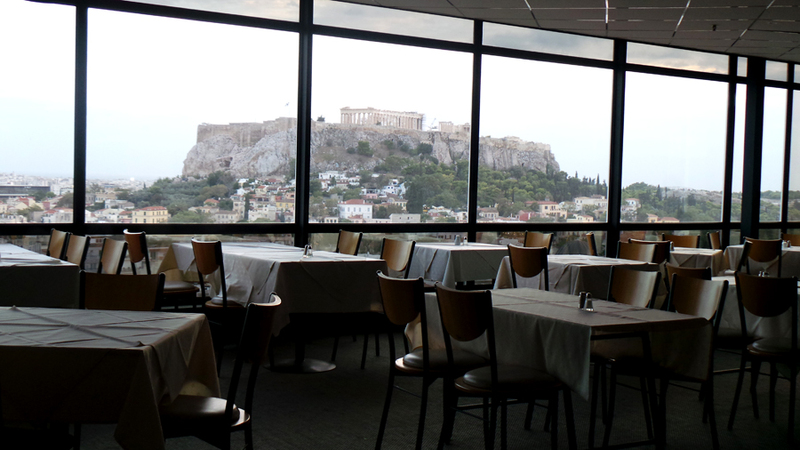 This is what you can call a breakfast with a view…. 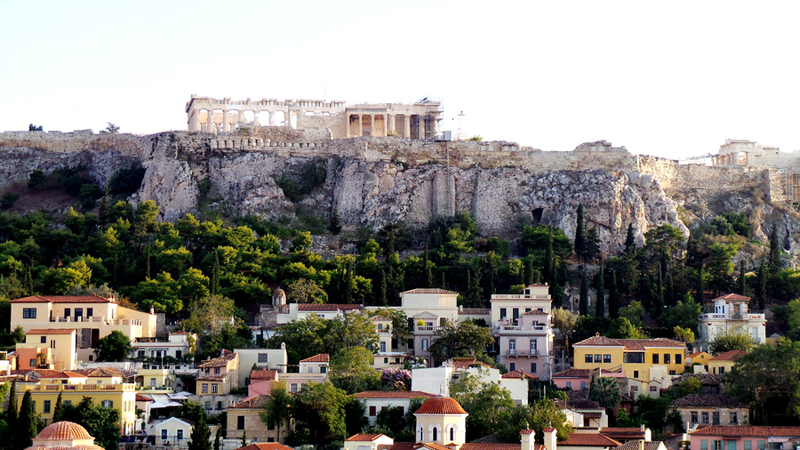 Zoomed in view of Mount Lycabettus/Λυκαβηττός, pronounced [likaviˈtos], a Cretaceous (the period between 145.5 and 65.5 million years ago) limestone hill in Athens, at 300 meters (908 feet) above sea level. Pine trees cover its base, and at its two peaks are the 19th century Chapel of St. George, a theatre, and a restaurant. 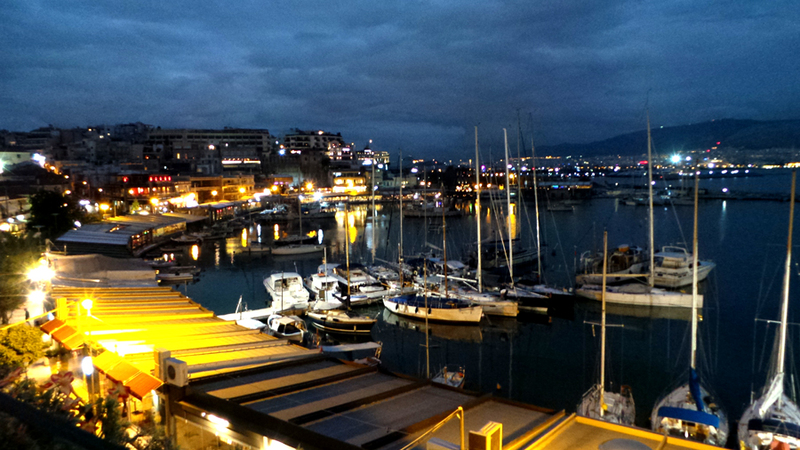 Piraeus, seen from the rooftop bar Mary Pickford which we were lucky to get to on their last day before closing since it´s a seasonal summer bar that was created by the team of Baba au Rum along with Varoulko Seaside. Great view, great cocktails, great bartenders, fantastic seafood and great music sums up this place. Seafood….at Mary Pickford. I don`t know what I was eating, I just know it was really amazing. 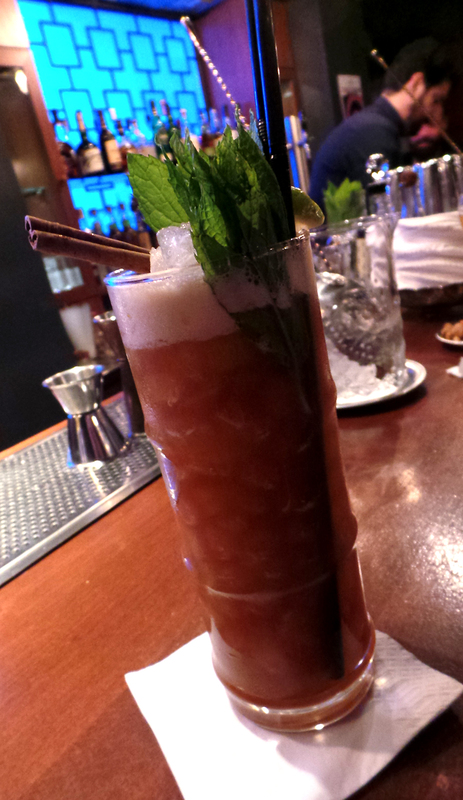 Incredibly tasty, a coffee Mai Tai at the Speakeasy. 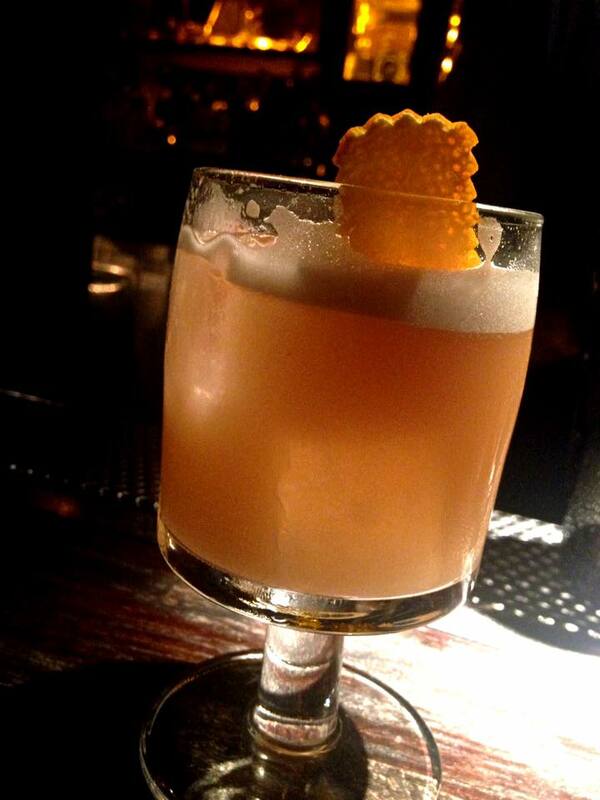 And Baba Rum Sour with Barbancourt rum and a decent float of Cadenhead Cask Strength rum from the Bellevue distillery. 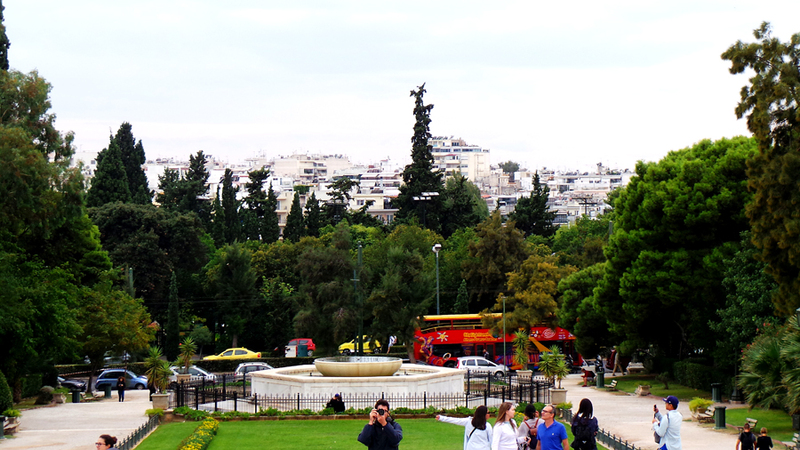 The beautiful National Gardens, located right behind the Zappeon Hall. 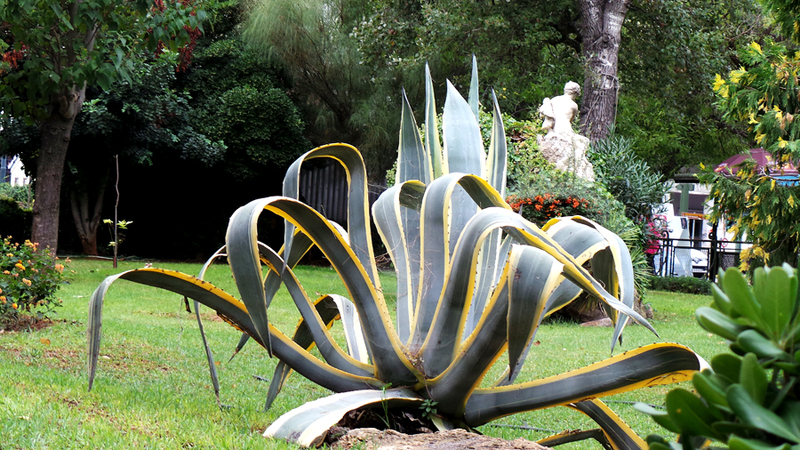 Impressive plants in the park. 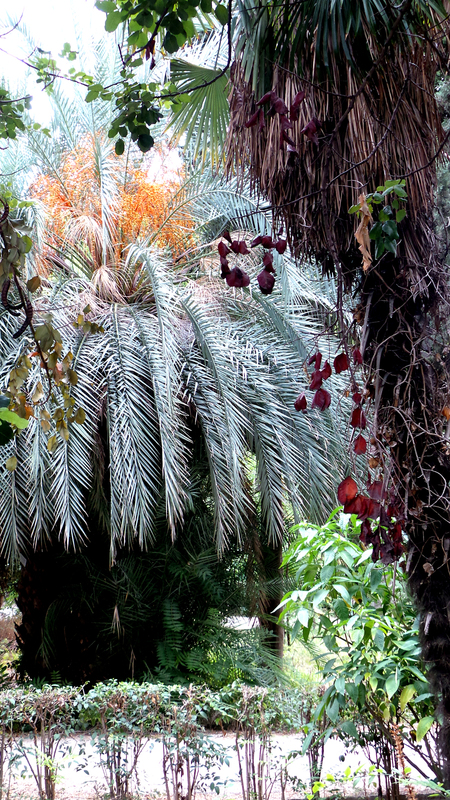 In the 1920s the park was renamed “National Garden”and became opened to the public and in honour of Queen Amalia of Greece, the entrance was moved to the 12 palms she planted and the street in front was renamed Queen Amalia Avenue. Since then the National Garden, is open to the public from sunrise to sunset. 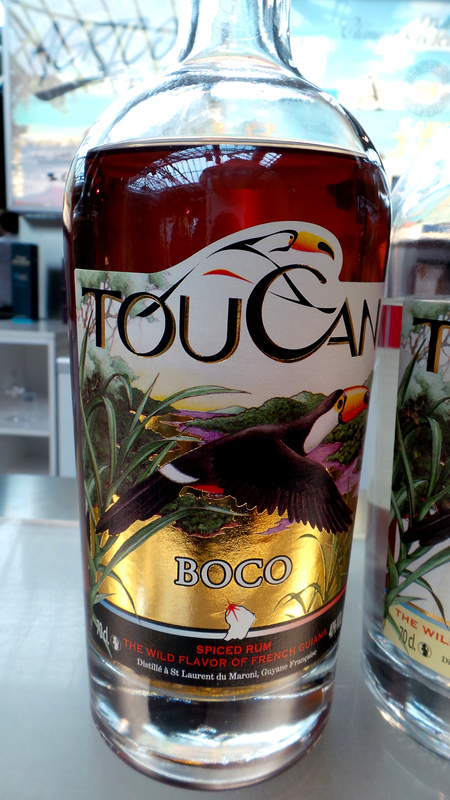 Baba au Rums iconic carousel…just love this one! 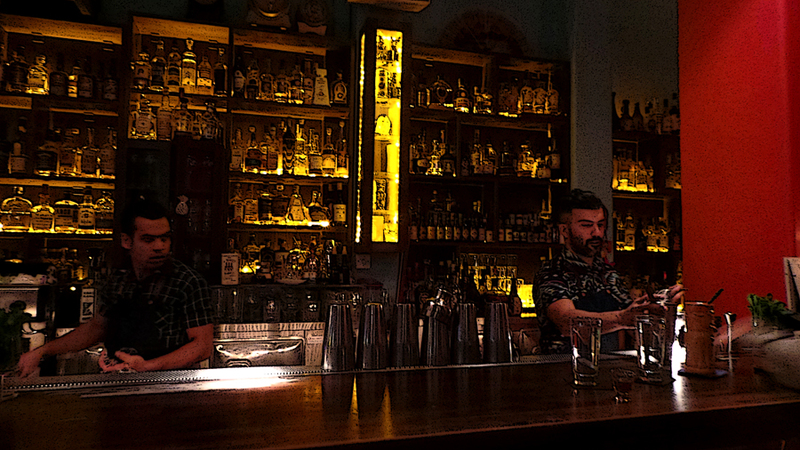 And my favorite bar in Athens, Baba au Rum. Pretty much sums it up! 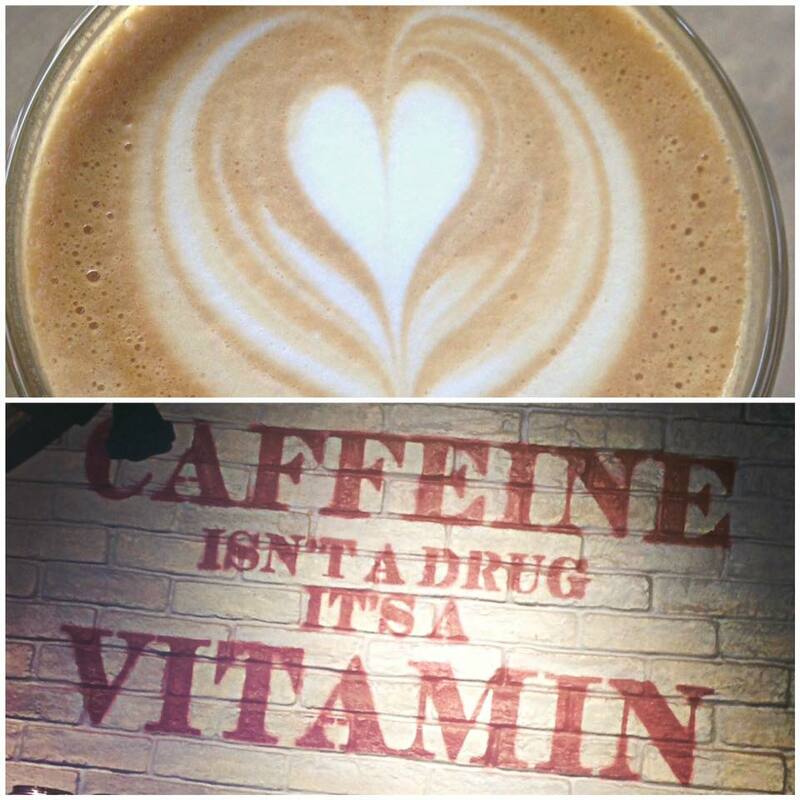 Cafe”Just Made 33″ a great place for breakfast. 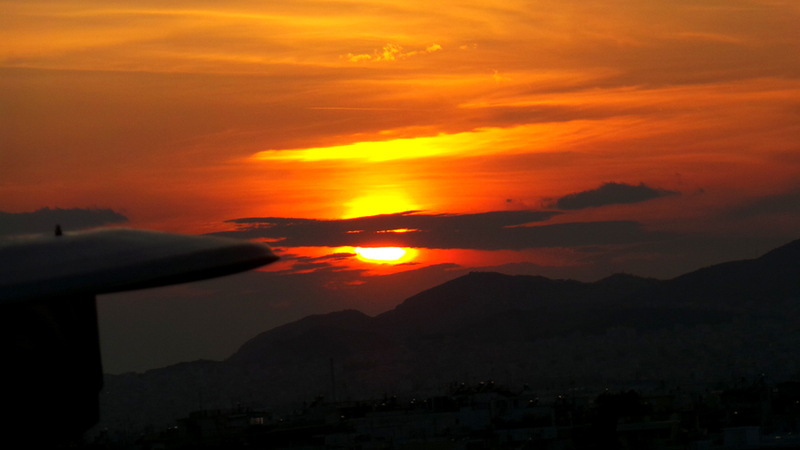 Hello Athens and thank you! I will be back! 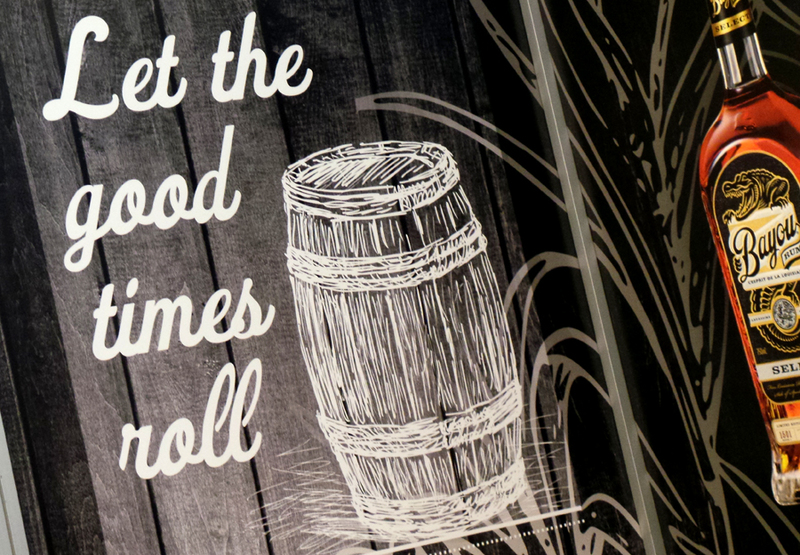 Welcome to Baba au Rum…. Some places just happens to have that special feel about them that makes you feel at home right away and Baba au Rum in Athens is one of those places. 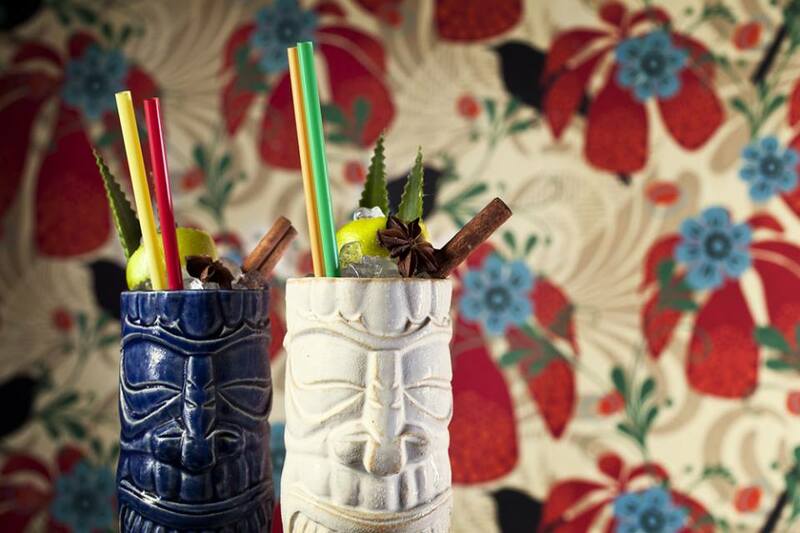 This world famous rum bar is not just a must go to bar while in Athens – it´s a reason to go to Athens! 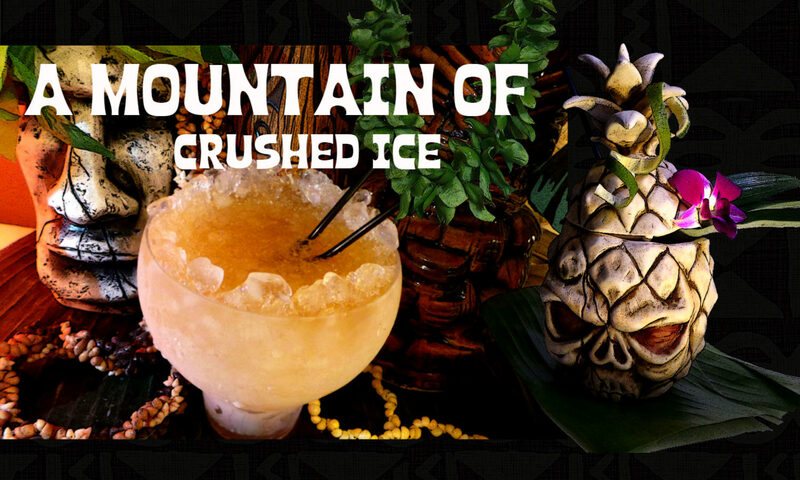 and trust me they will pamper you with lots of love, an array of amazing cocktails, tiki drinks, rums and other spirits! 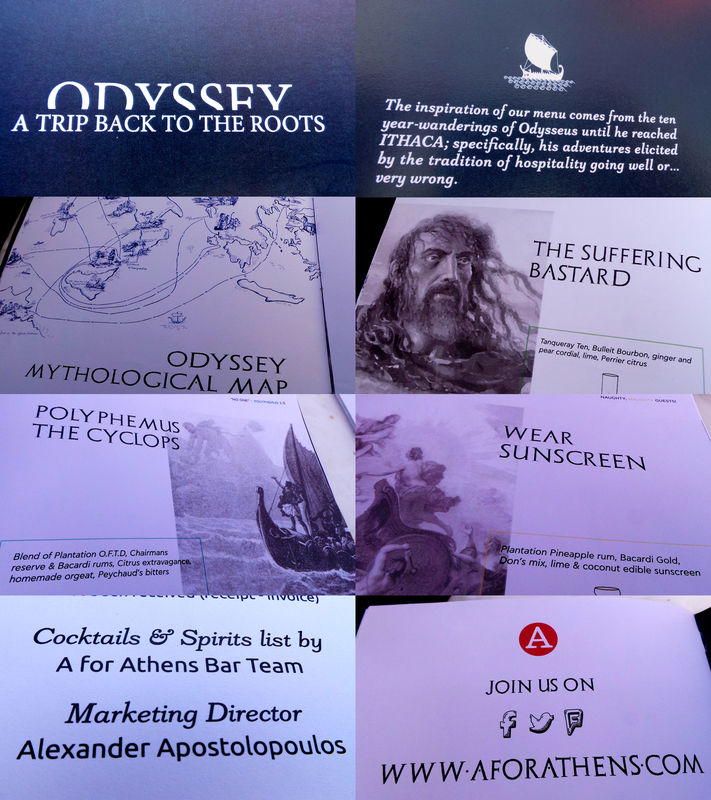 One of the first things you most likely do when you arrive at a bar is checking out the menu and the cocktail and spirits menu of Baba is quite special….it comes in the form of a very cool designed book which has been awarded twice at the Athens bar show. 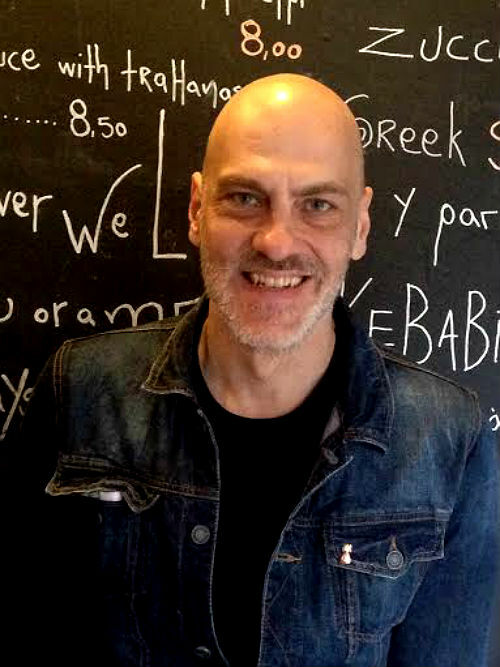 The menu was designed by Kostas Theocharis and has been presented at the Milan Expo Exhibition and also in bars in Paris and Nikosia where it received great reviews. 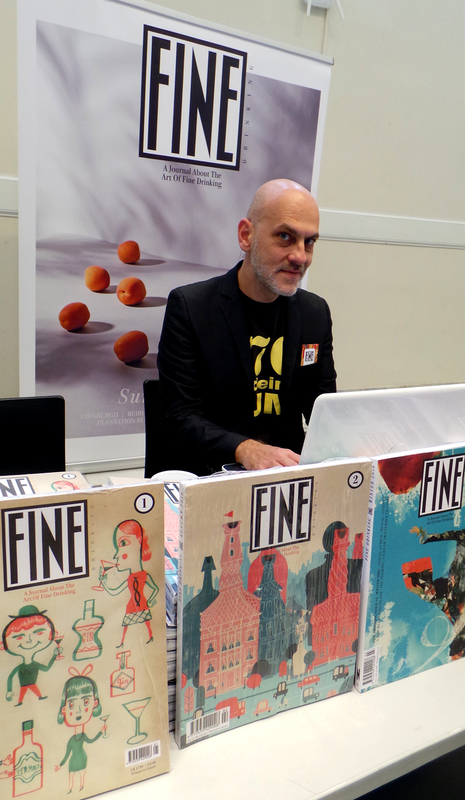 The menu book is presented both in greek and english and it´s a simple cool, playful design! 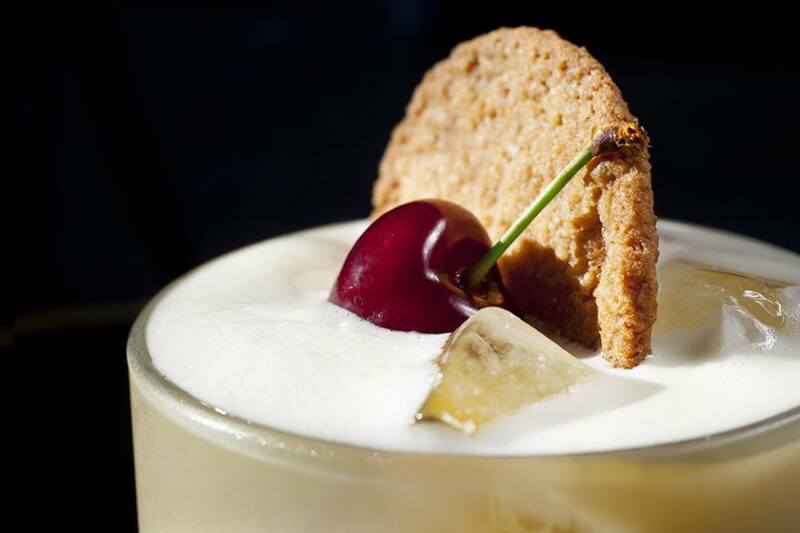 Baba au Rum was founded in 2009 by Thanos Prunarus who has been a bartender since 1999 and this bar has greatly influenced the bar and cocktail scene and the bar which was awarded one of the World’s 50 Best Bars in 2013 — always at the top lists worldwide. Baba Au Rum is often awarded the Best Bar in Greece and Thanos is considered as a main influencer in his country. And once again Baba has been included for one more year at World’s Best Bar Sellection! Thanos travels around the world to discover rum, visiting and participating in rum festivals the world over, including judging at the world final of the Havana Club Grand Prix in Cuba which he recently did. 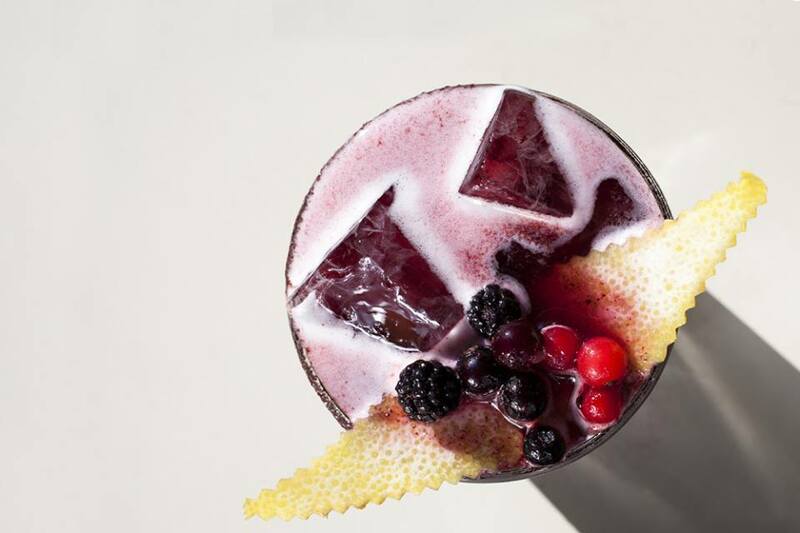 Thanos also publishes an International Cocktail and Travel magazine called FINE DRINKING. I could not have written it any better so I link you to this very good and in depth article about Thanos! and here is a cool video from Baba au Rum! Baba au Rum is, despite the name and being a rum bar, a place where you can just sit back, feel at home and drink anything you want, it doesn´t have to be rum… And regardless of what spirits are used – the cocktails are immaculate wonders of liquid art that is a joy to behold and imbibe – but this place is a lot more than just the drinks….it`s a whole experience and the fact that people travel from all over the world to come here speaks for itself. I for my part love it! 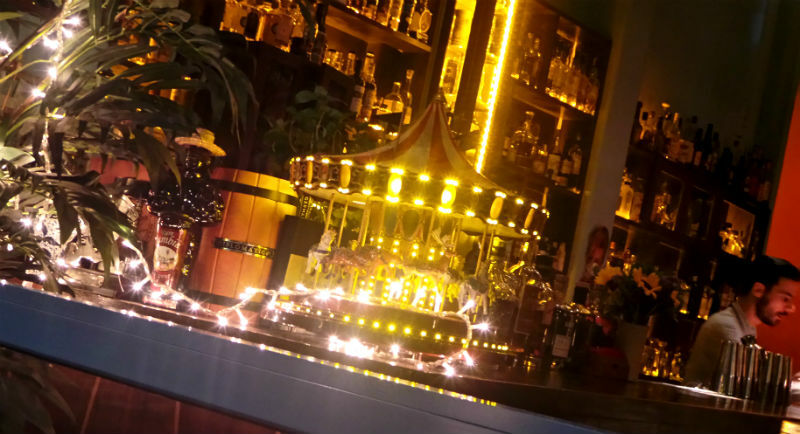 I like when you come to a bar with super friendly bartenders, unpretentious relaxed atmosphere, interesting and beautiful interior, amazing drinks, good music and super comfy bar stools! – Baba got it all. 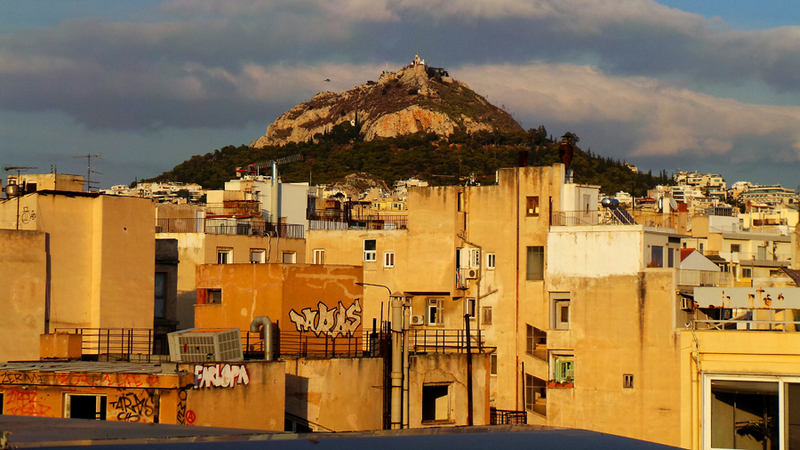 If you get a chance or happens to visit Athens, do yourself a favor and go and spend time at Baba! One thing that striked me on my visit was their amazing warm hospitality….they went out of their way to make me feel part of their family, never will I forget that! thank you everyone at Baba! 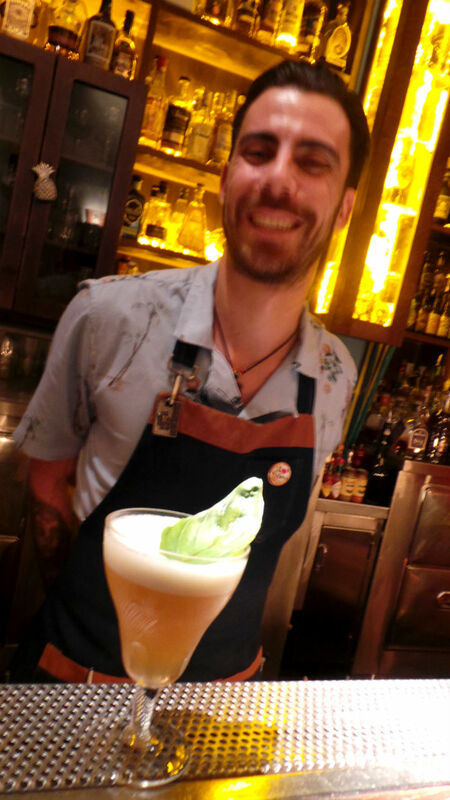 My drinks which were consistently good, were made by the amazing bartenders Ellias Stergiopoulos, Phaedon Papakonstantinou and Nikos Gartzolakis – paying attention to the smallest details – you guys rock!! So when you sit down…which drink to start with is not that easy because there´s a lot of great drinks to choose from the menu. 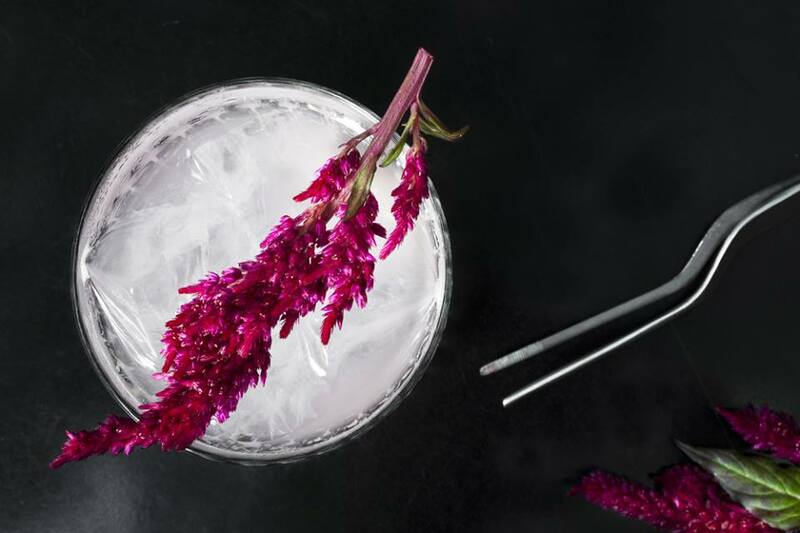 One that I really liked a lot ( but I liked everything I tried) was their beautiful namesake drink, the Baba au Rum cocktail – a sweet and savory umami daiquiri with both sweet and botanical notes, and it´s a beauty…. 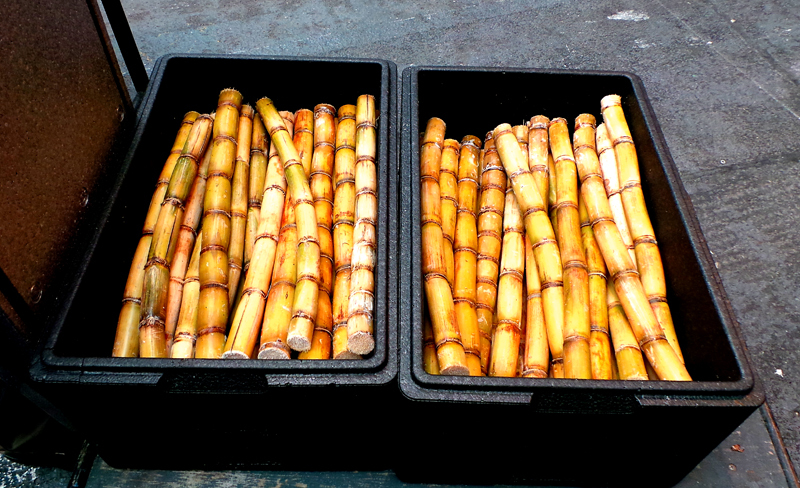 The taste is fresh, sweet and savory at the same time, smooth like silk and incredibly refreshing. I leave you here my readers to enjoy a bunch of pictures from Baba, because you know they speak louder than my words…some of these pics are mine and some are courtesy of Baba. Baba au Rum cocktail made by Phaedon Papakonstantinous. 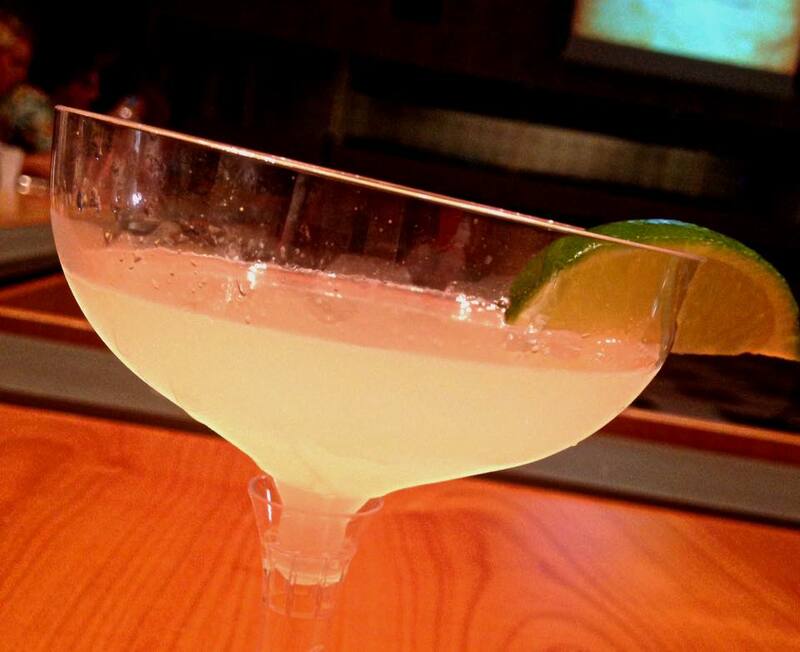 RumFire Daiquiri…to finish the night! They make the work look so easy….but don`t be fooled, they work really hard! 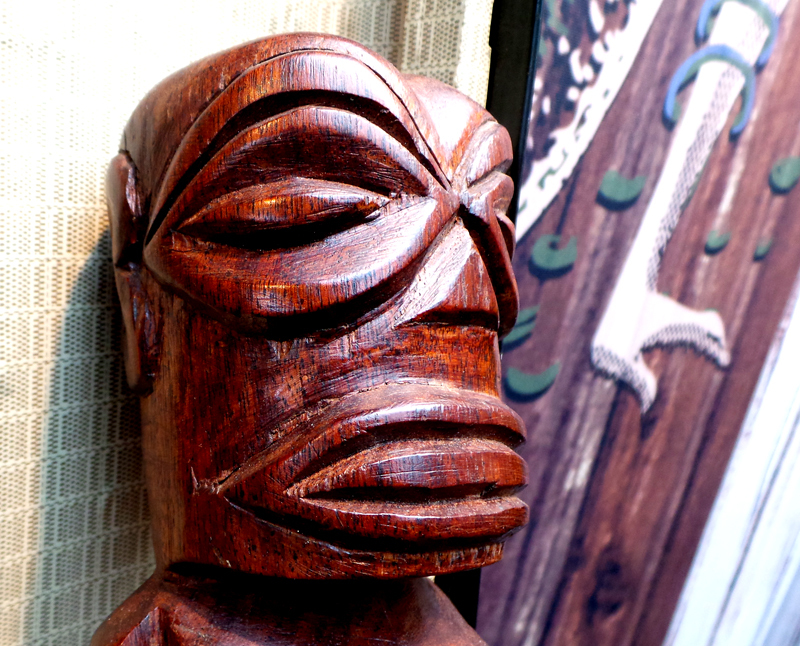 And the “Lulu White” tiki mug! 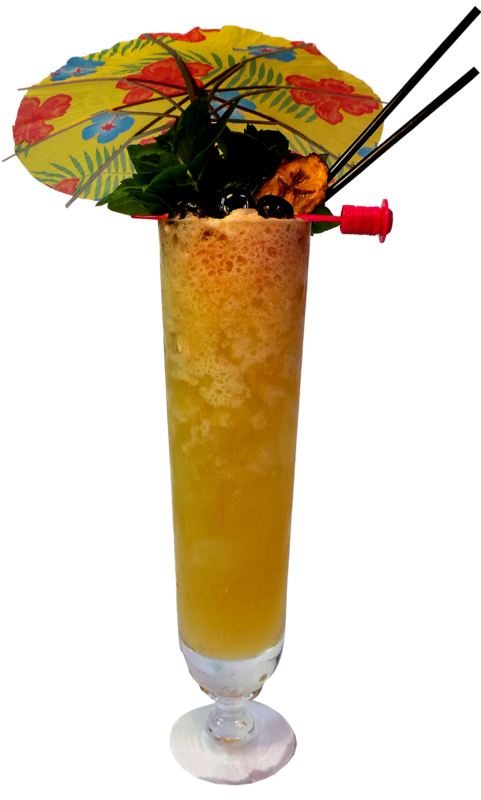 If you don`t get thirsty when you see these kind of cocktails…..
Guadeloupe Tiki Punch! 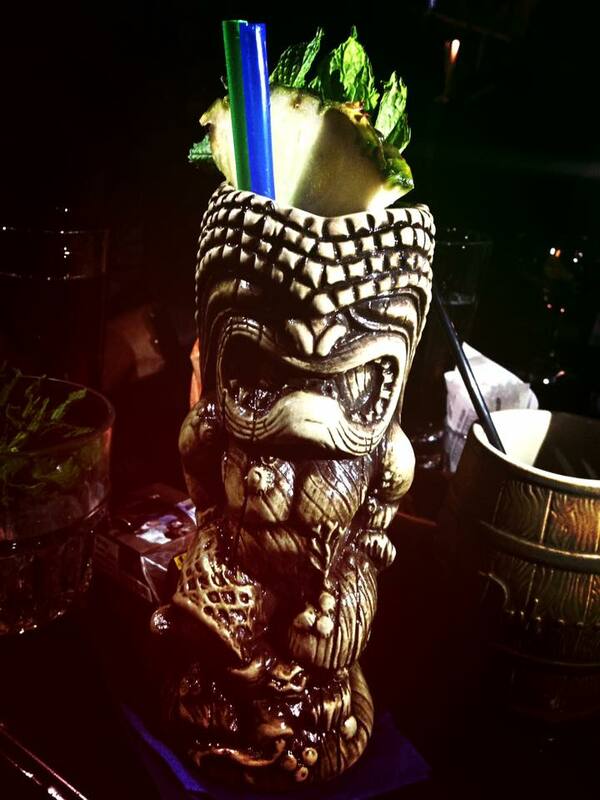 served in one of Baba`s own cool tiki mugs. 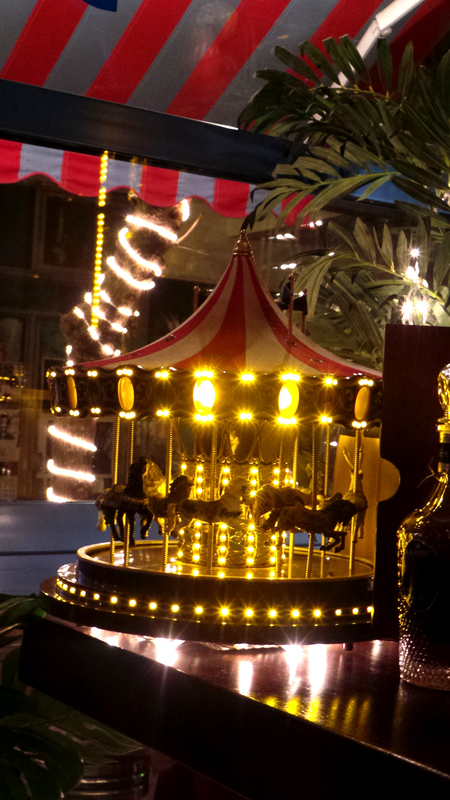 An interesting and fun detail is the lit up mini carousel….so playful and fun! 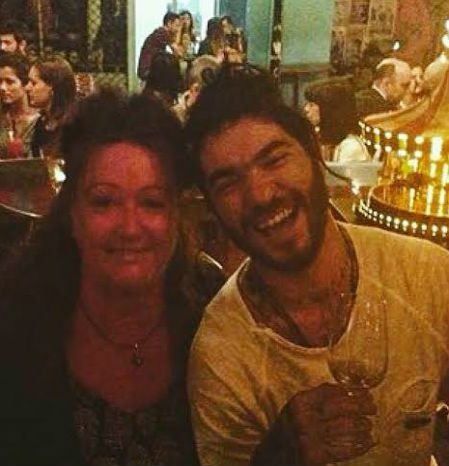 And finally, yours truly with Nikos Arvanitis ( Rum Traveller in the Caribbean and writer of the upcoming “From the West Indies to the World” and bartender at the lovely bar Kolokotroni 9 (you should go there! 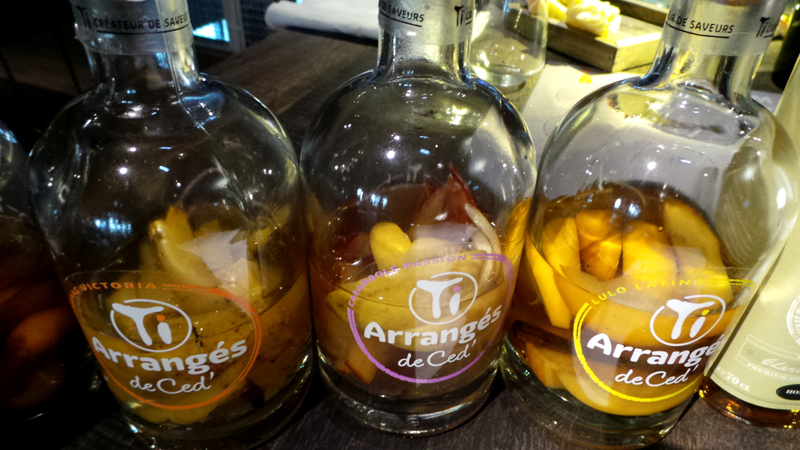 and while you explore the bars close to Baba, go and try some fine rhum agricoles and cocktails at Rehab too! 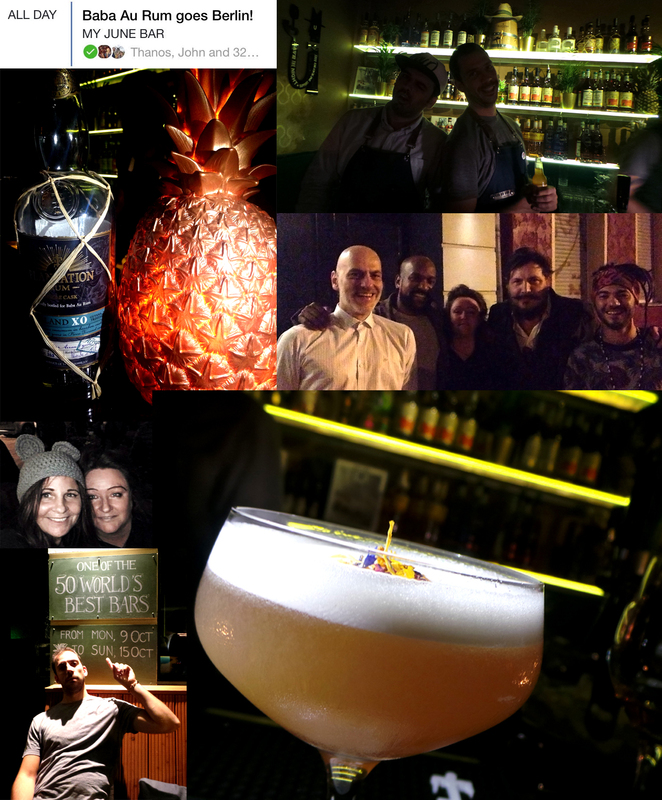 – another great bar) drinking and talking rum! 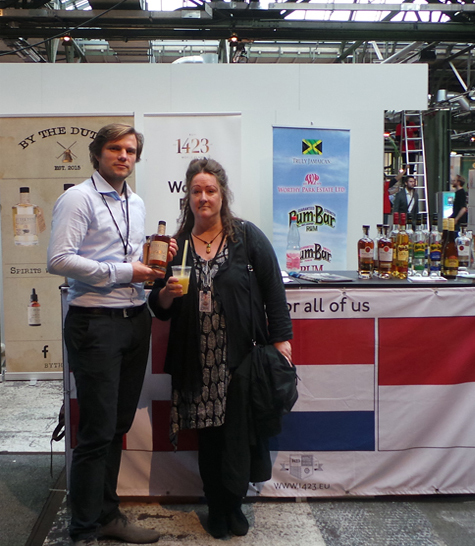 the International Rum Family is really a wonderful thing! When “From the West Indies to the World” is ready I`ll post about it on this website. 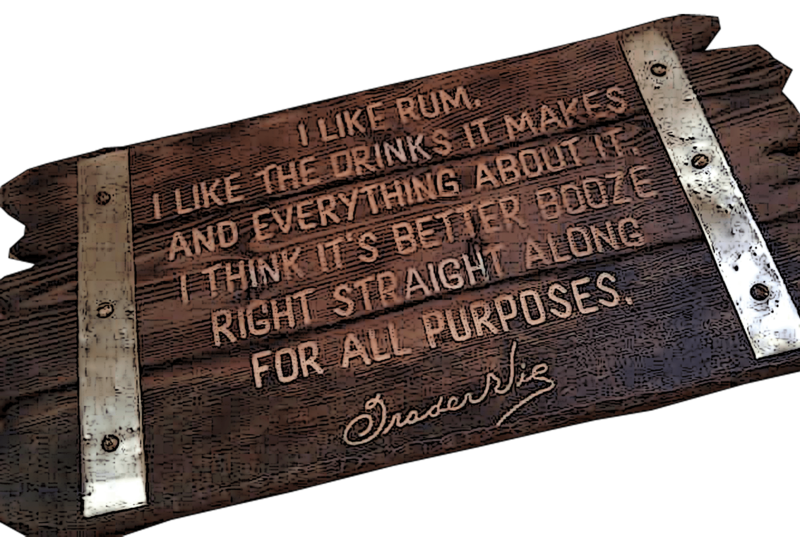 Cheers to rum and good friendship!